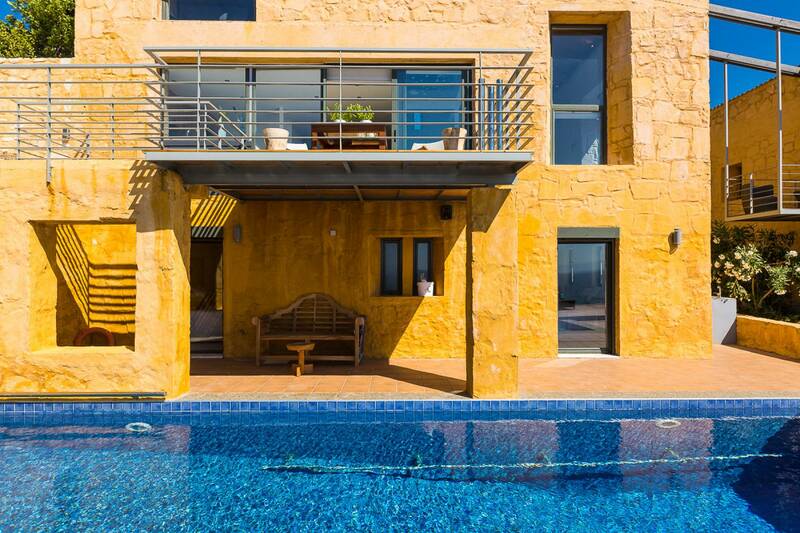 Yellow Dream Villas is a luxury development consisting of three spacious independent villas. 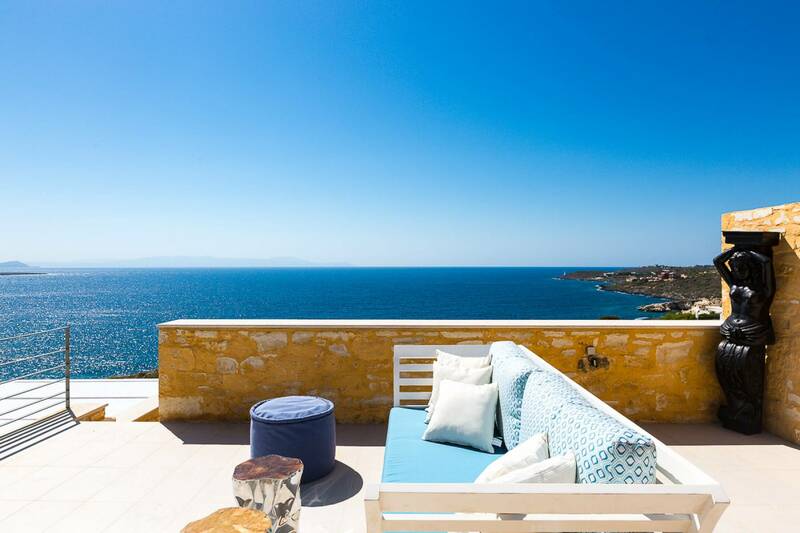 The villas overlook the delightful Kalathas Beach with a lovely view of the spectacular White Mountains as a colorful contrast. 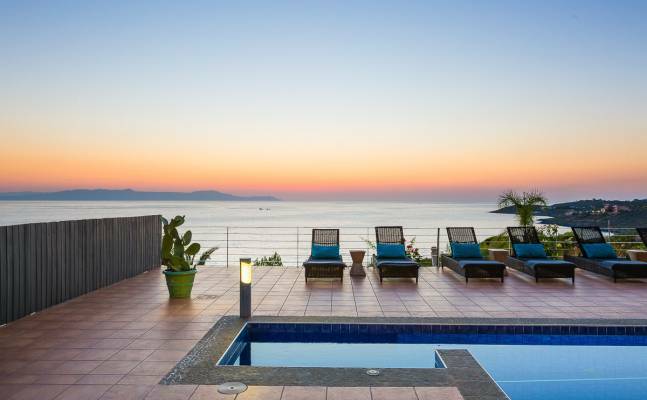 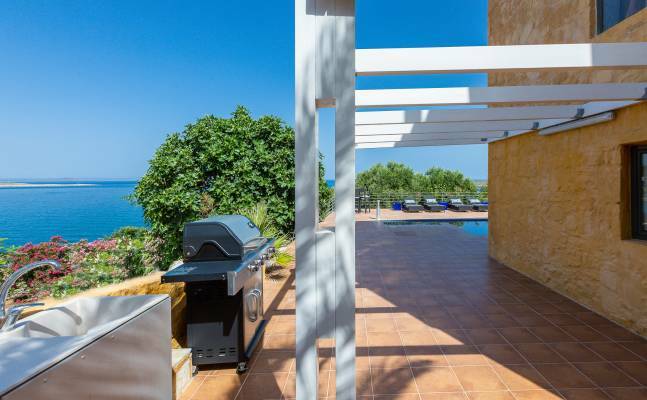 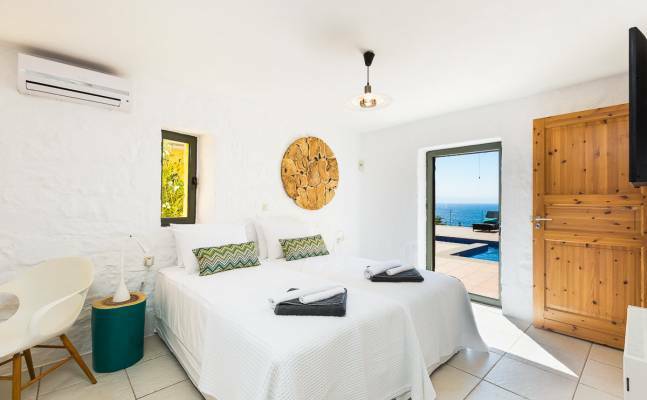 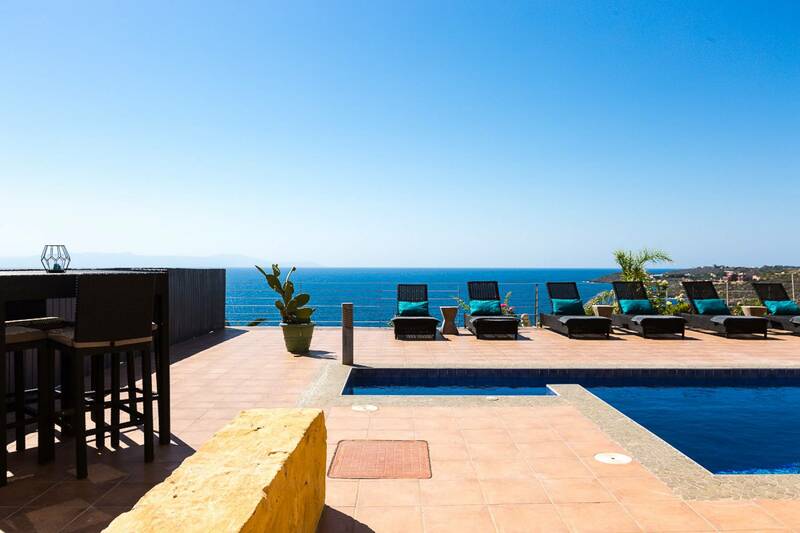 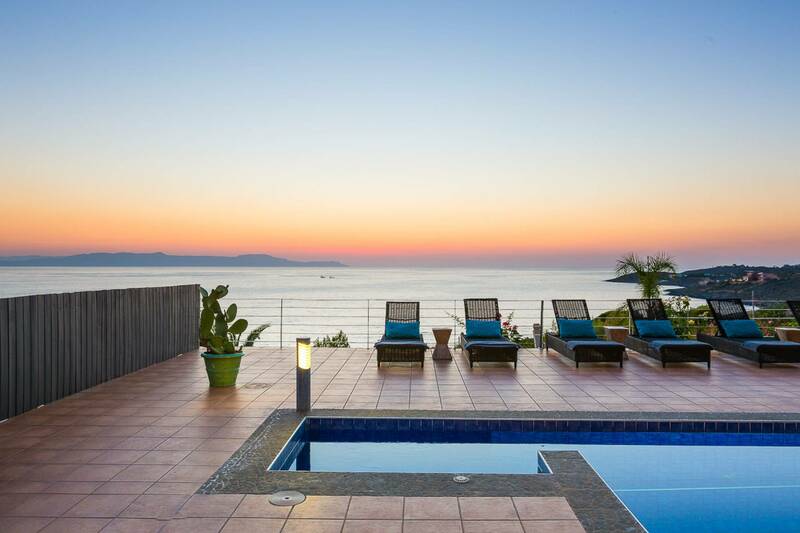 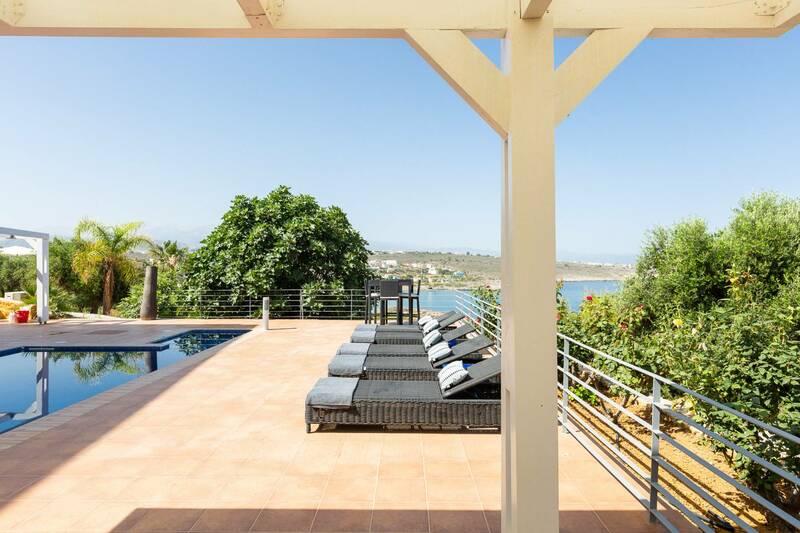 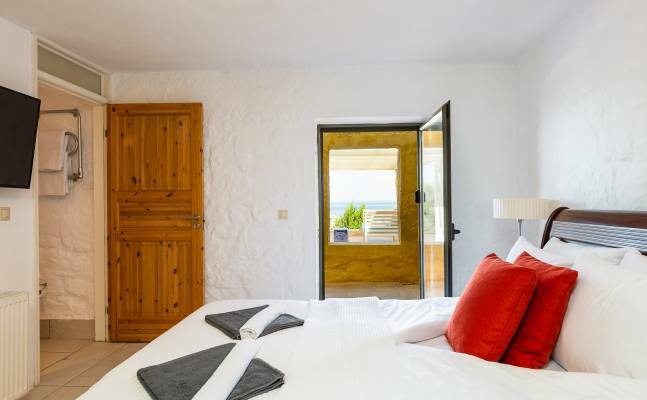 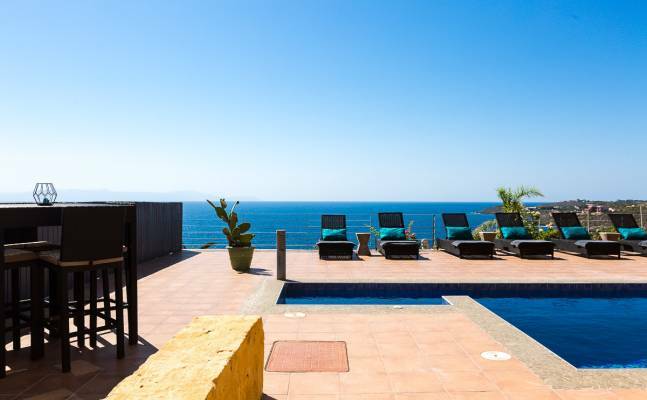 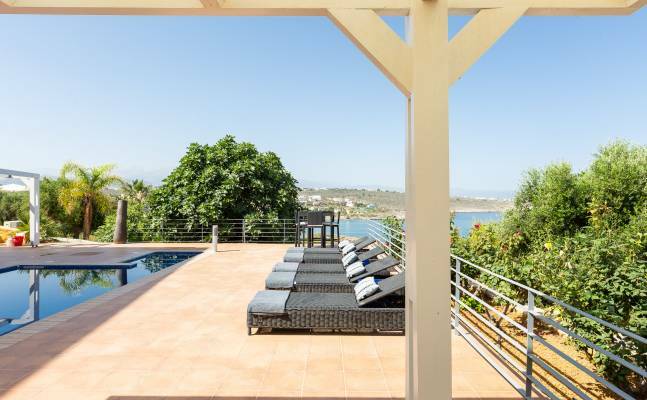 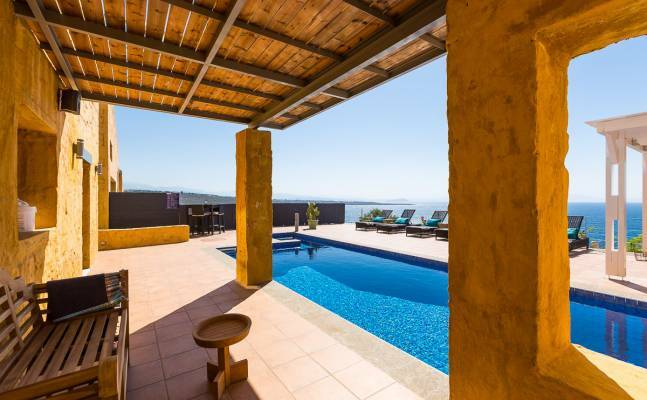 Each villa can accommodate up to 6 people.It is possible to rent all the three villas together. 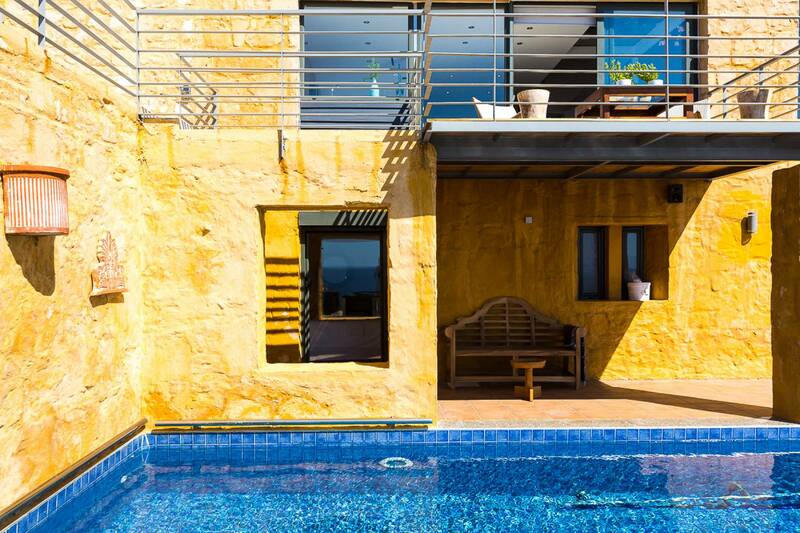 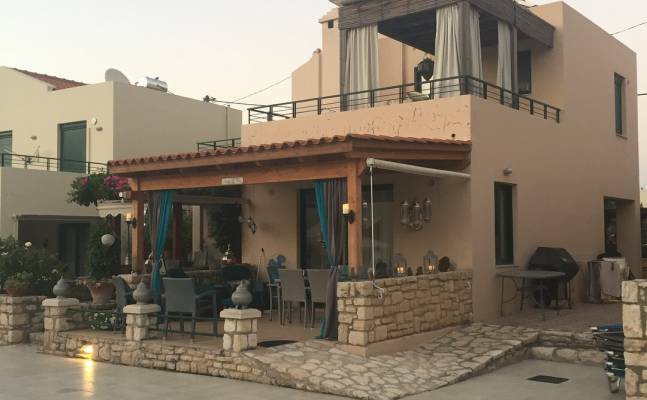 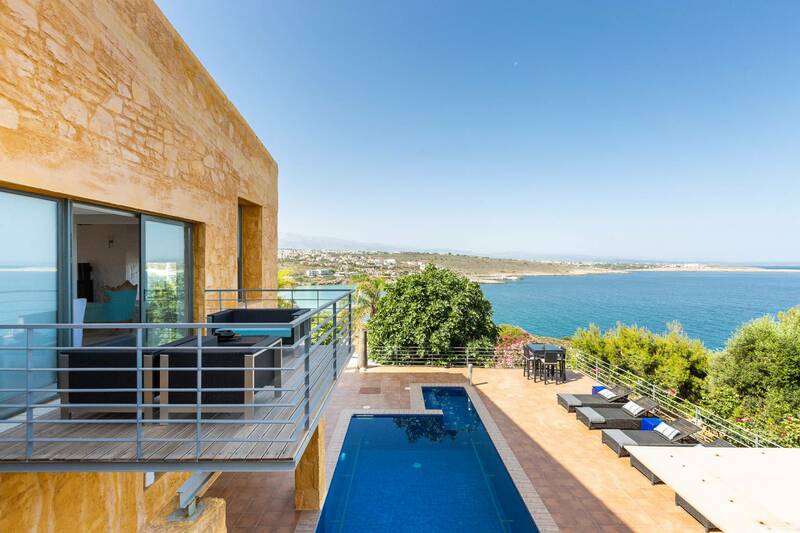 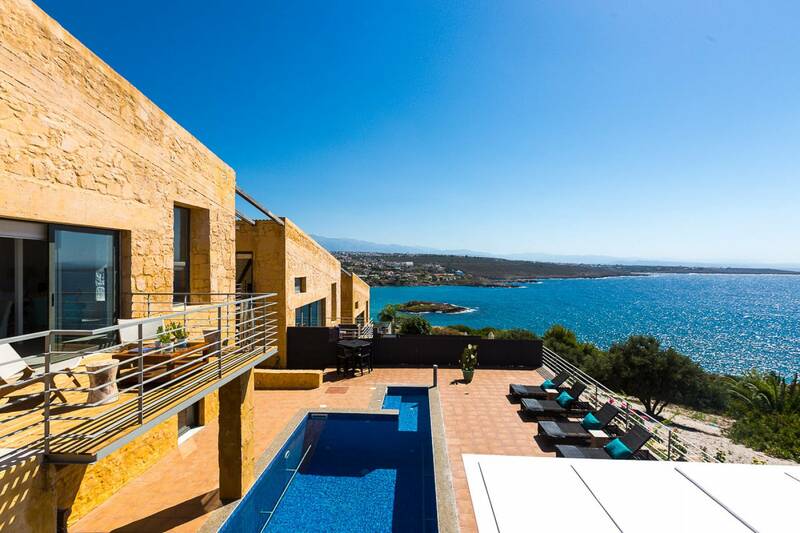 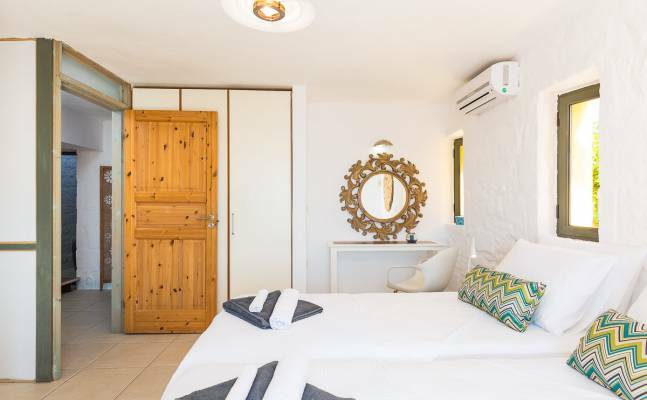 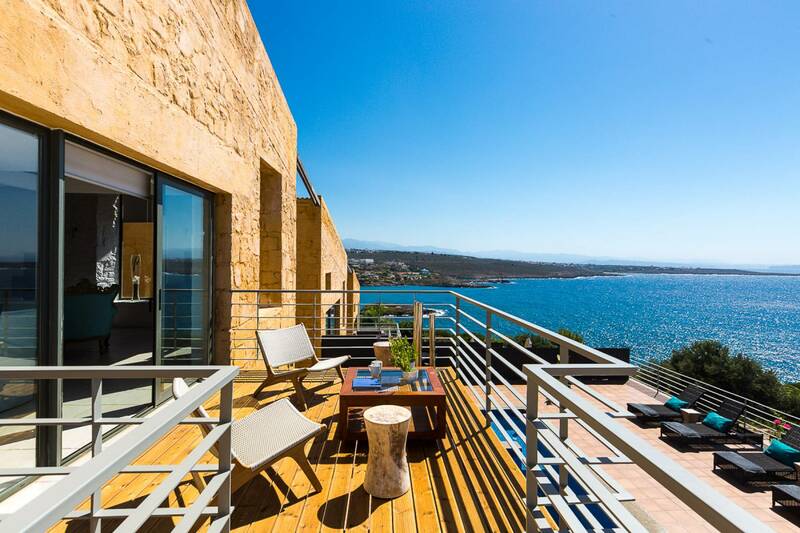 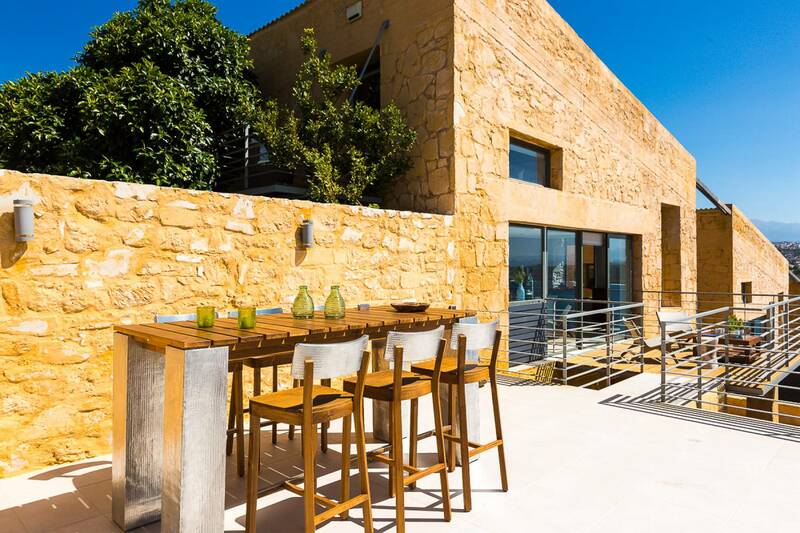 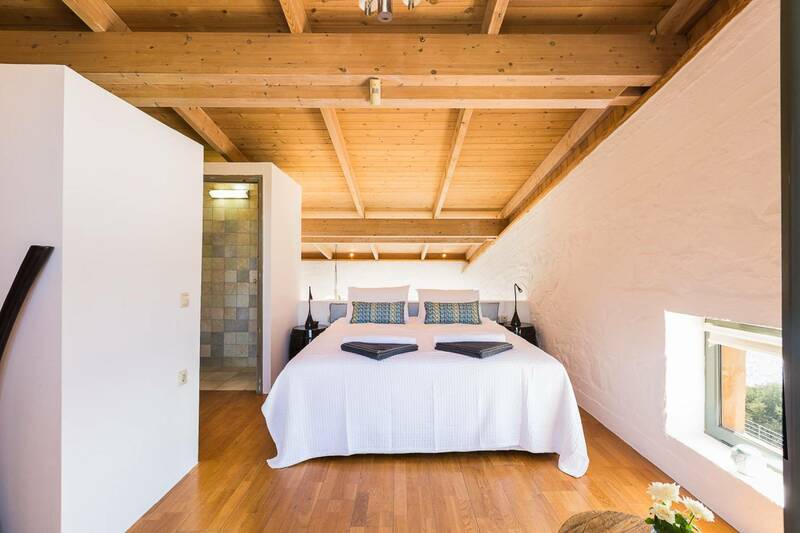 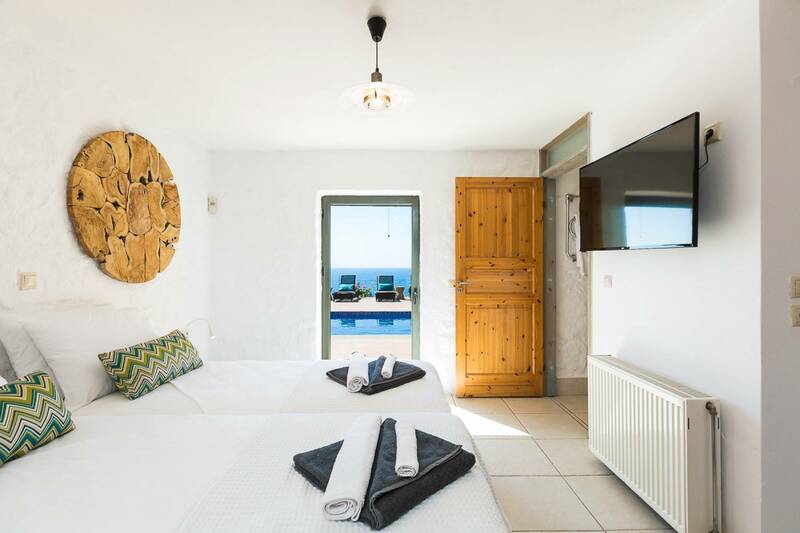 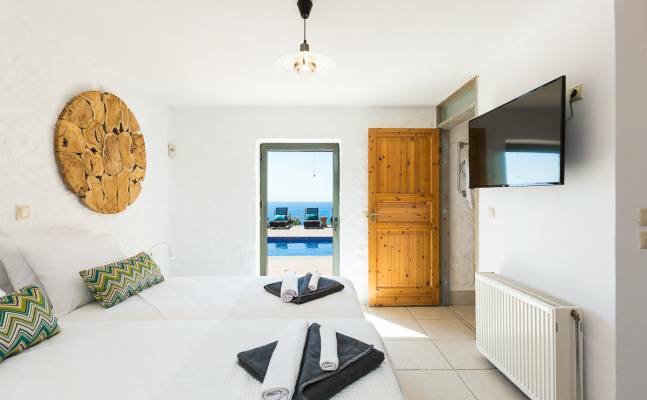 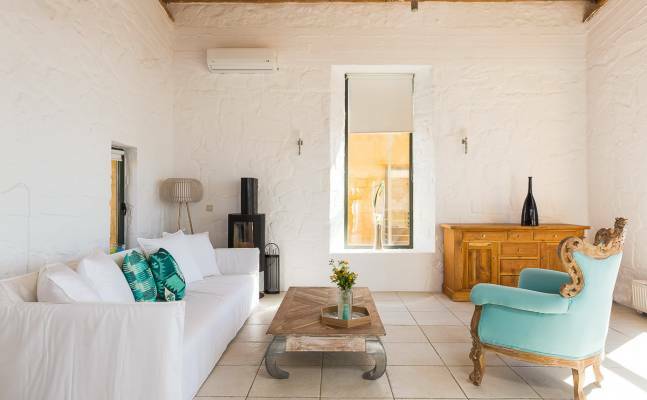 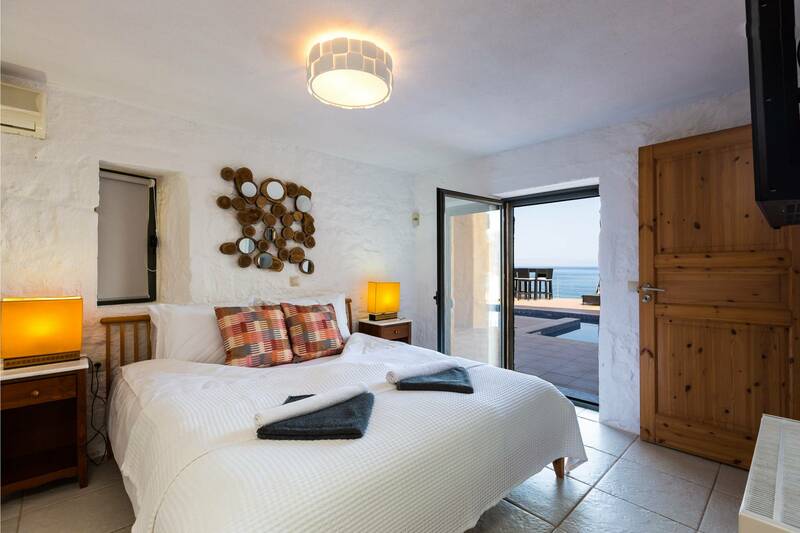 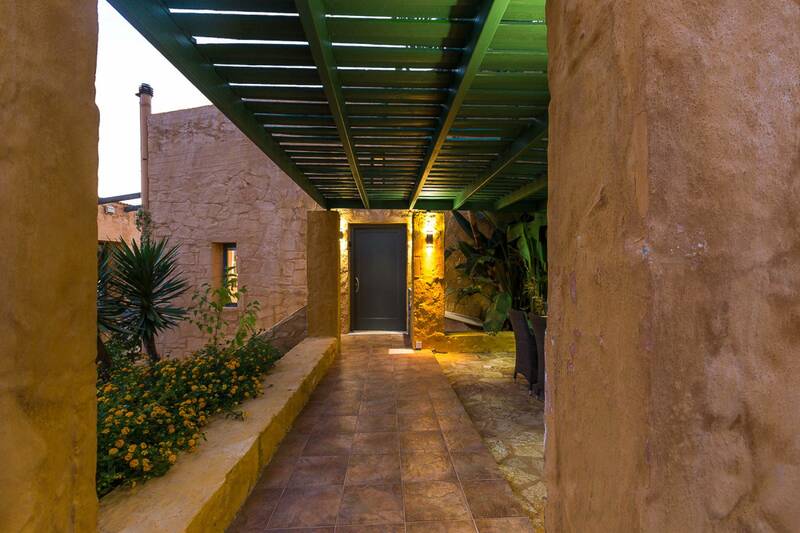 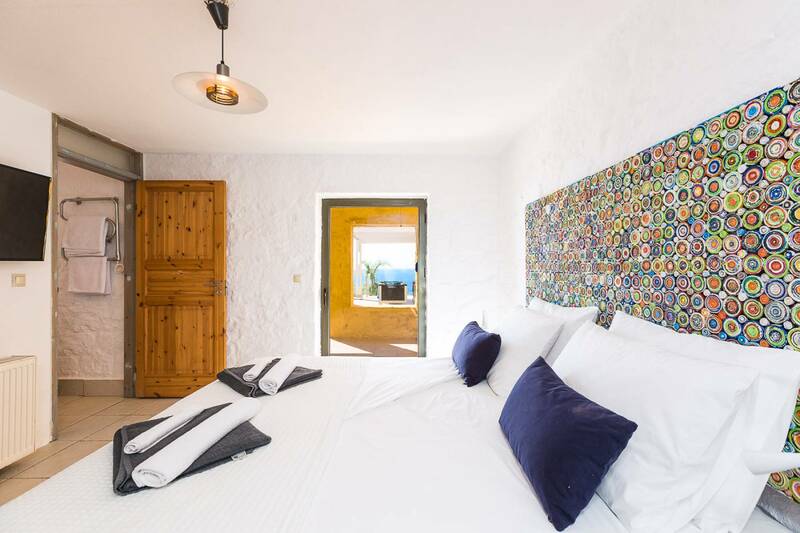 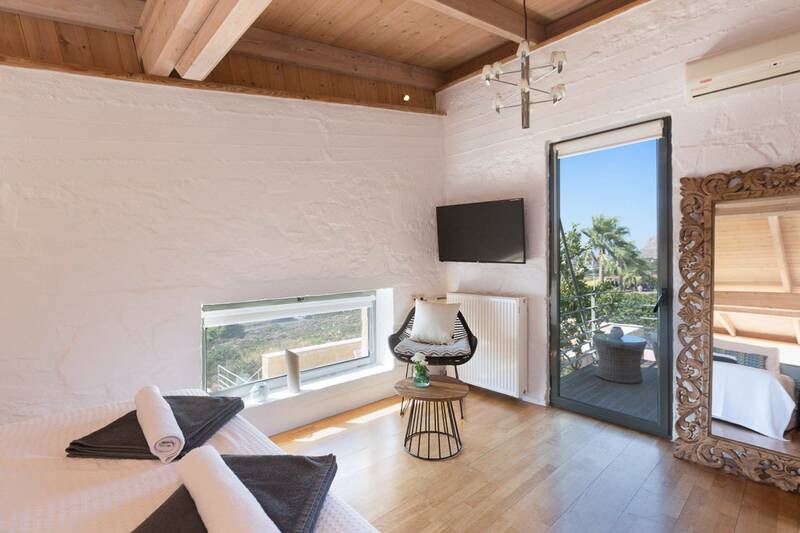 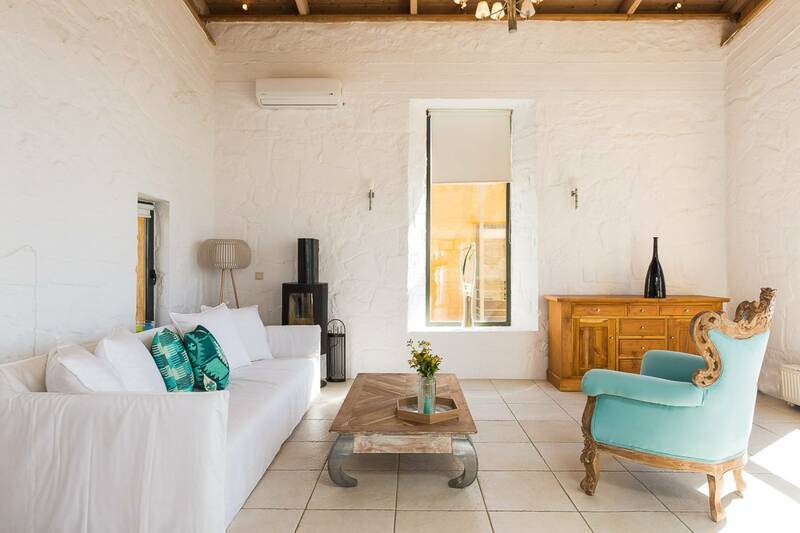 The uniquely constructed luxury villas with an architectural design that dates back a century ago, are located in the rugged Cretan nature. 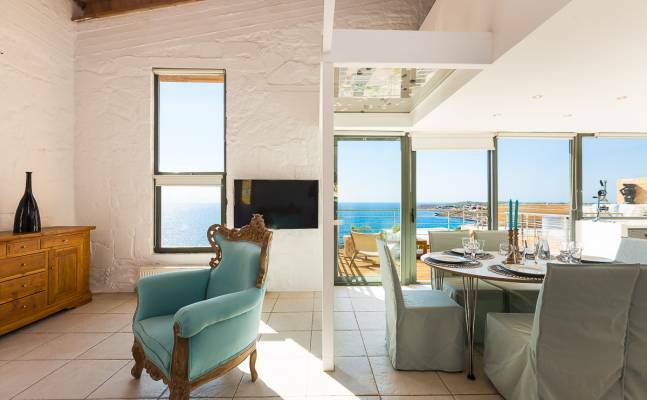 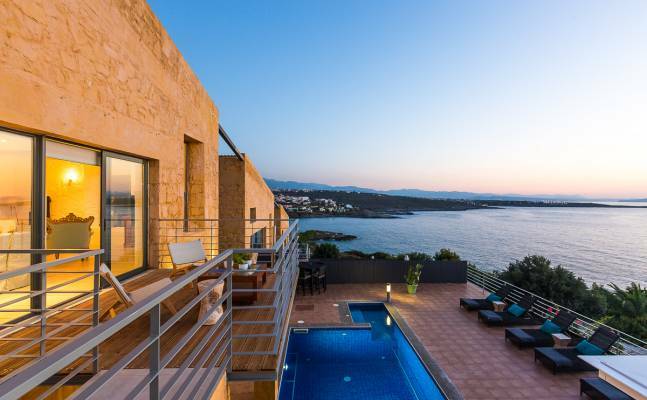 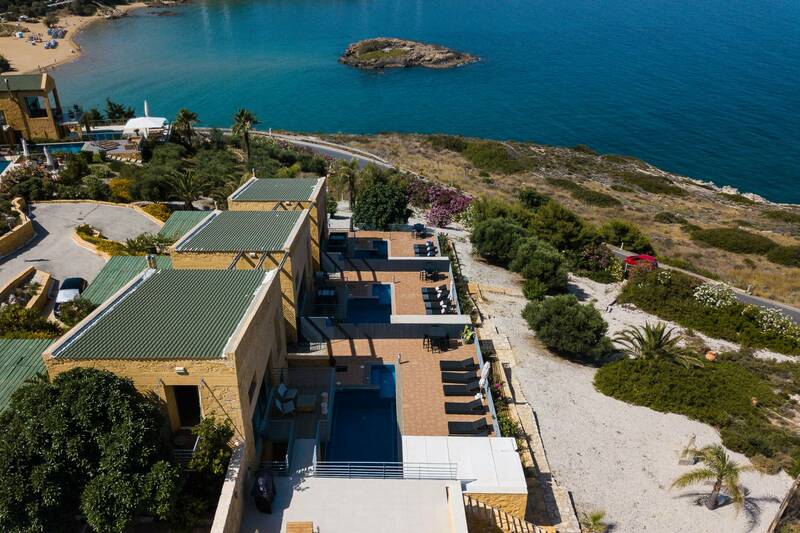 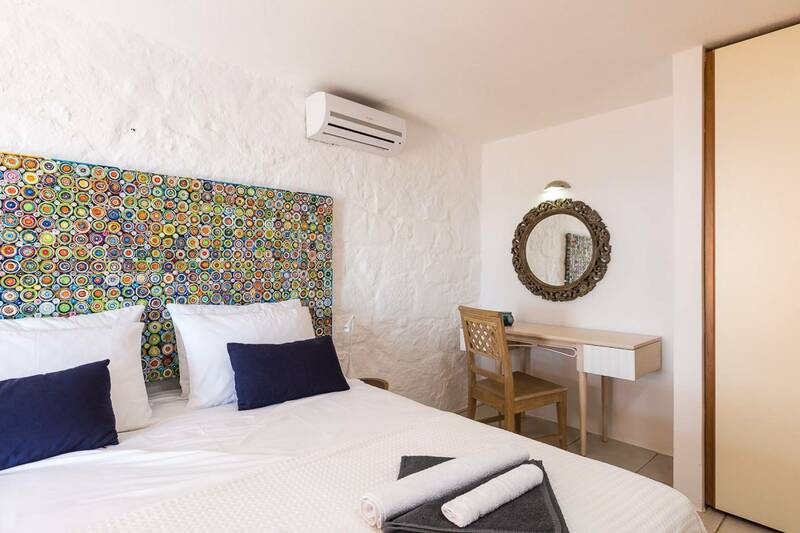 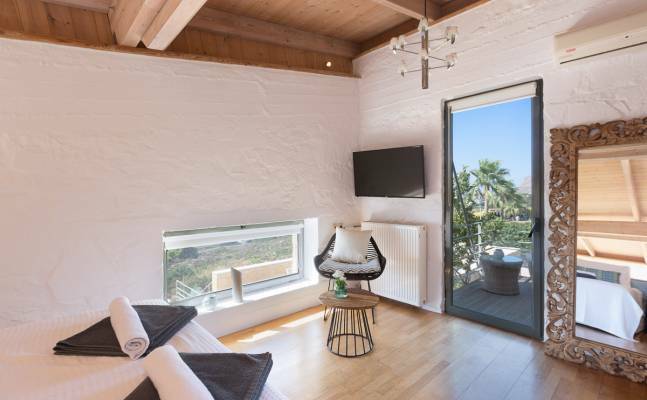 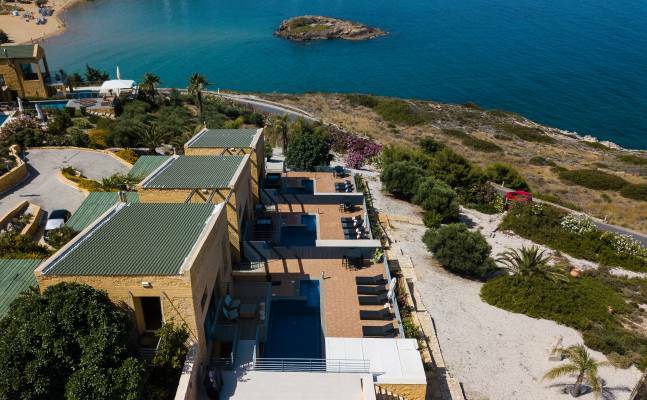 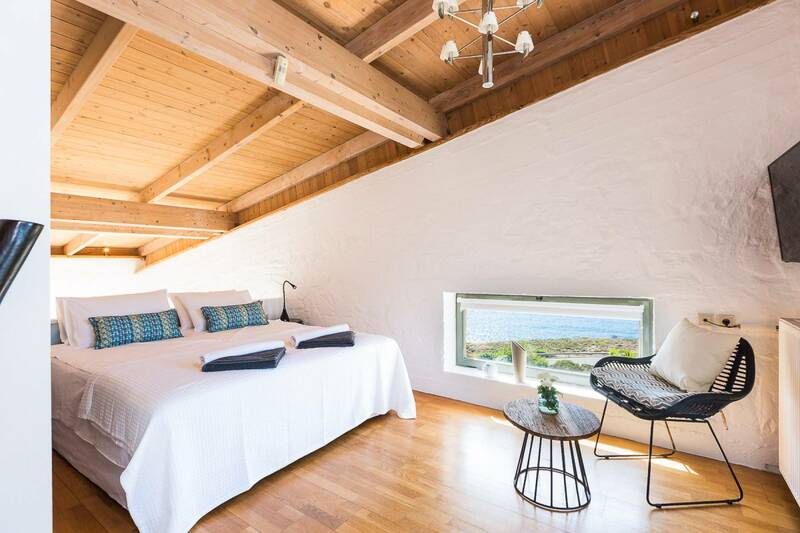 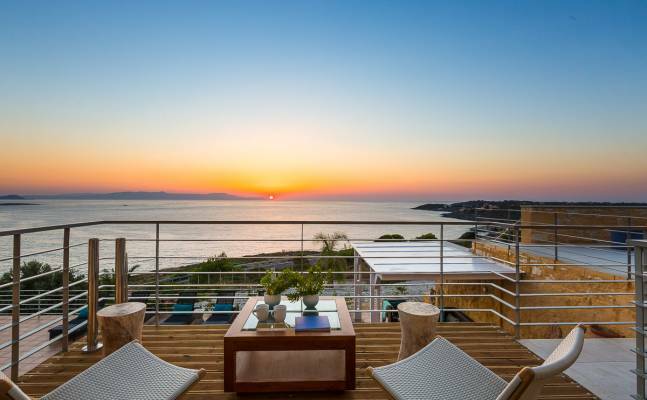 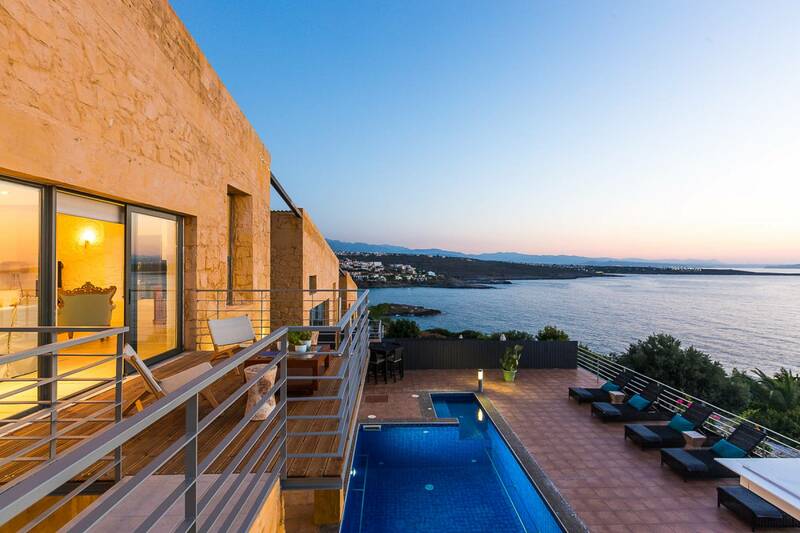 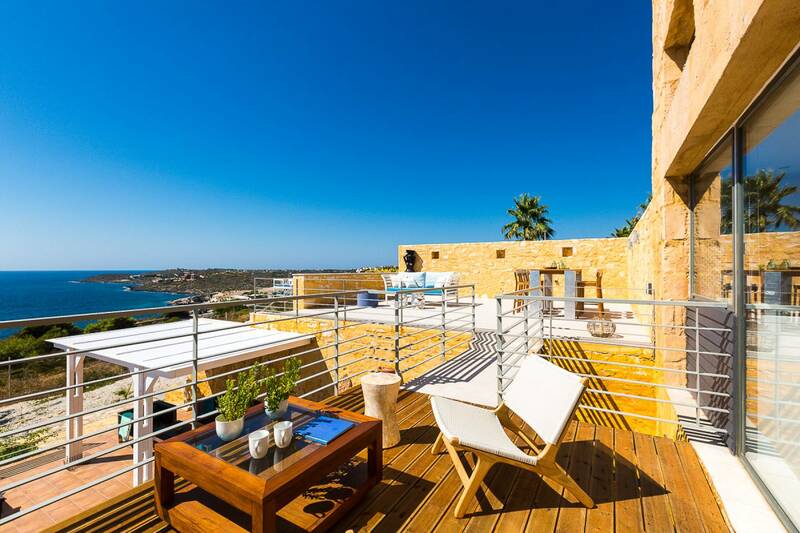 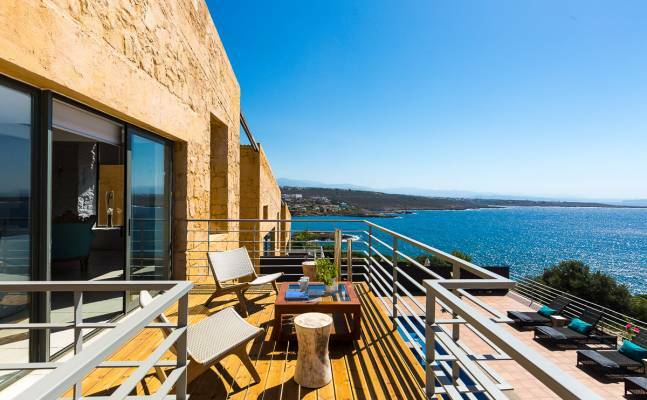 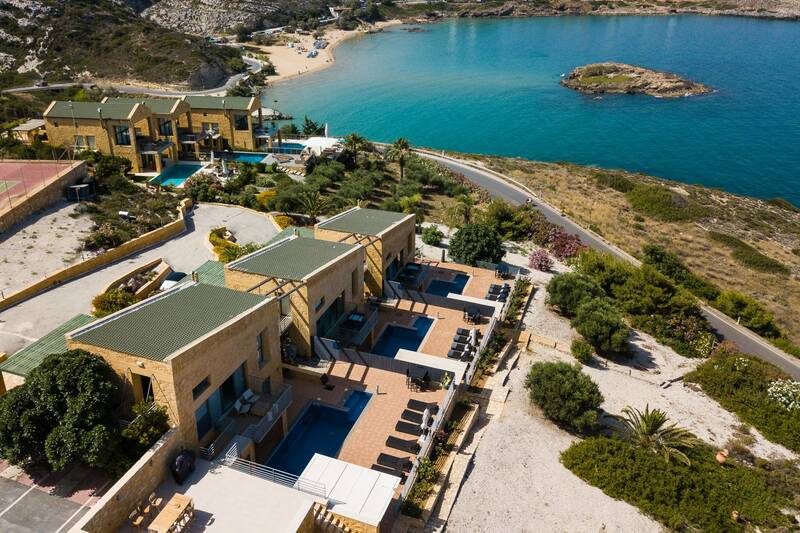 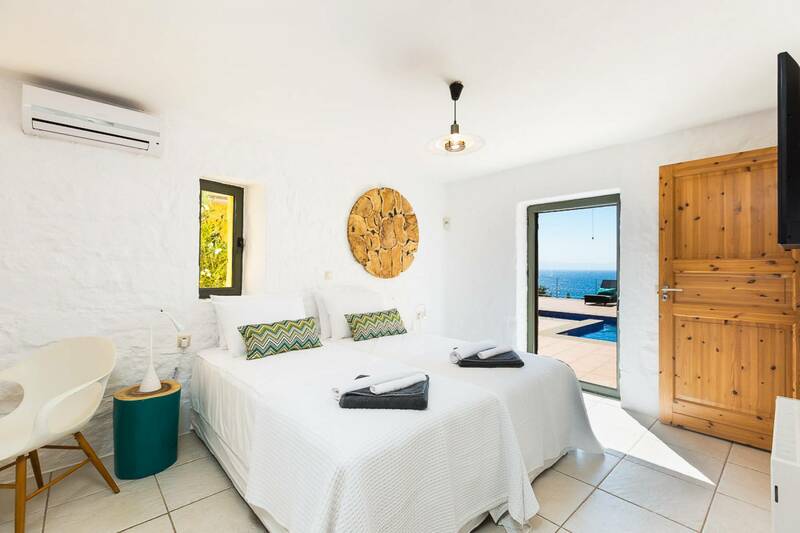 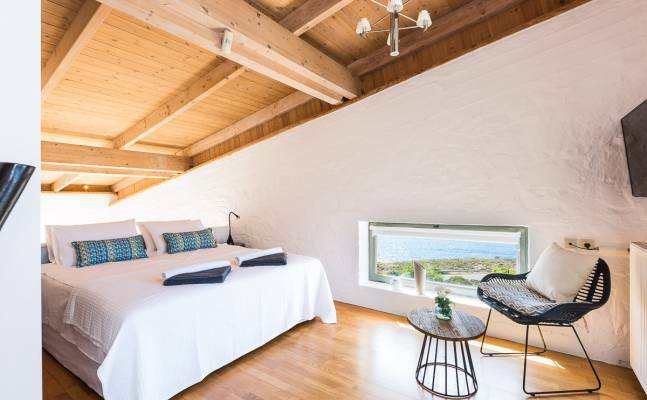 Combined with the blue horizon of the Mediterranean Sea (Chania Crete) it creates the most spectacular picture of a destination for those seeking tranquility in a luxurious environment. 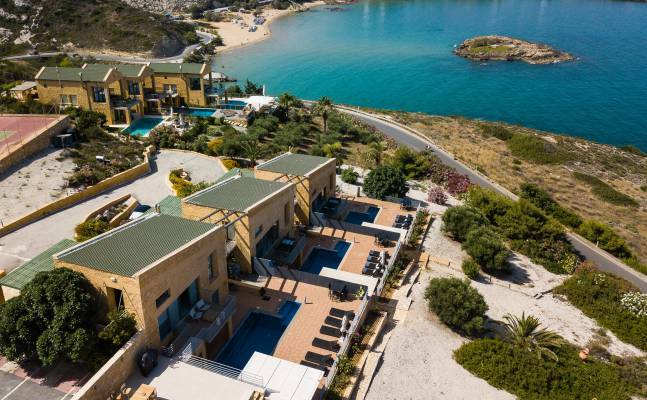 The owners aimed to create an ultimate retreat for families, friends and couples within the idyllic setting of the villas. 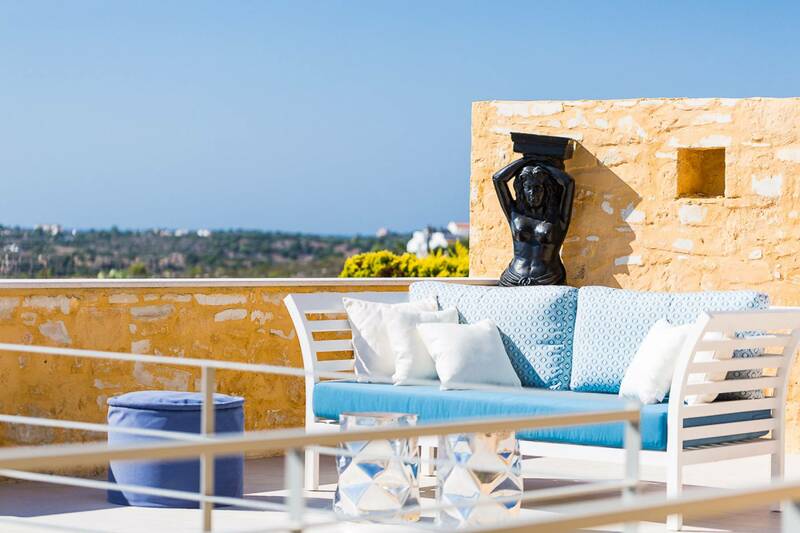 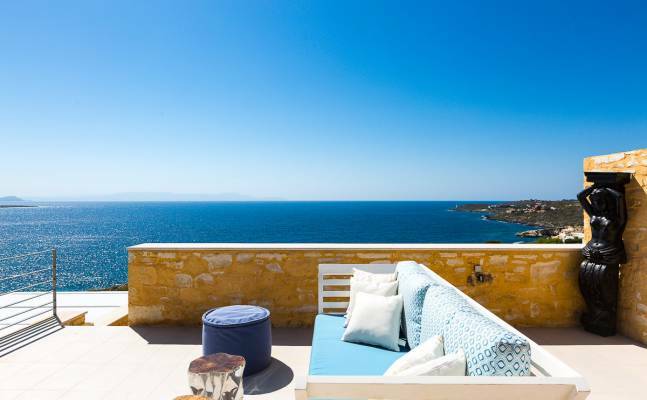 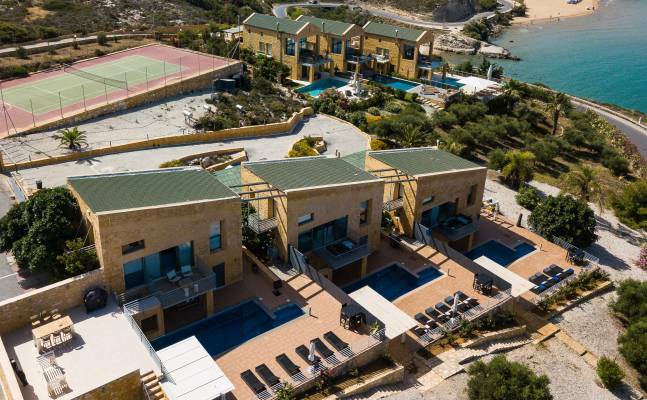 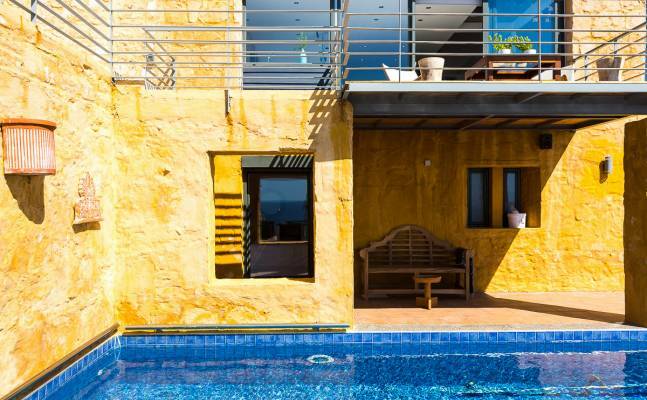 Incredible surroundings and views together with a mix of colours and aromas of Cretan herbs and flowers, combined with the exceptional architecture, make the Yellow Dream Villas a top destination. 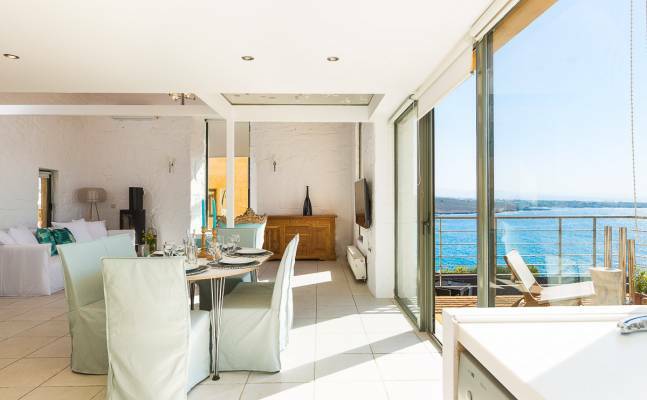 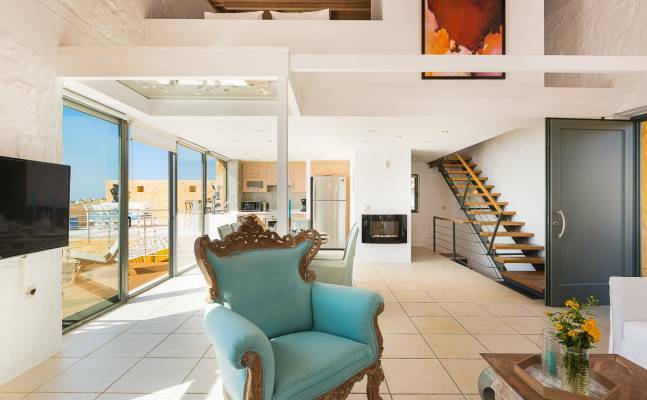 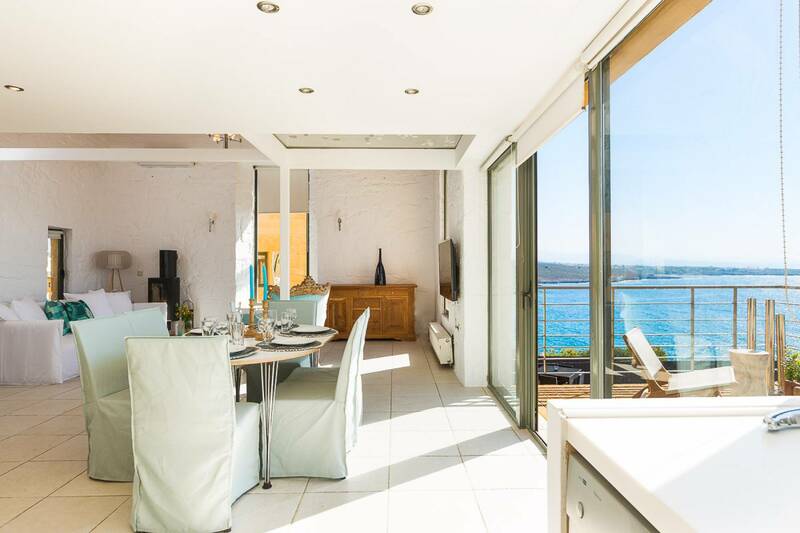 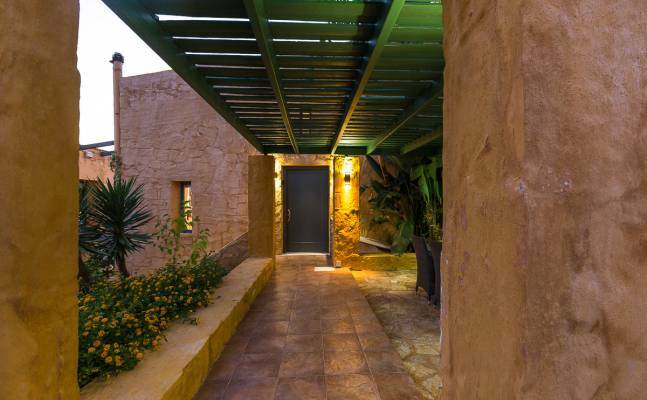 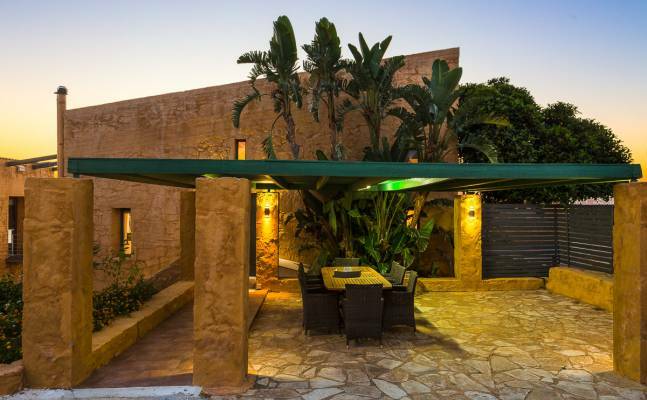 The air-conditioned villa has 150m² of living space laid over three floors. 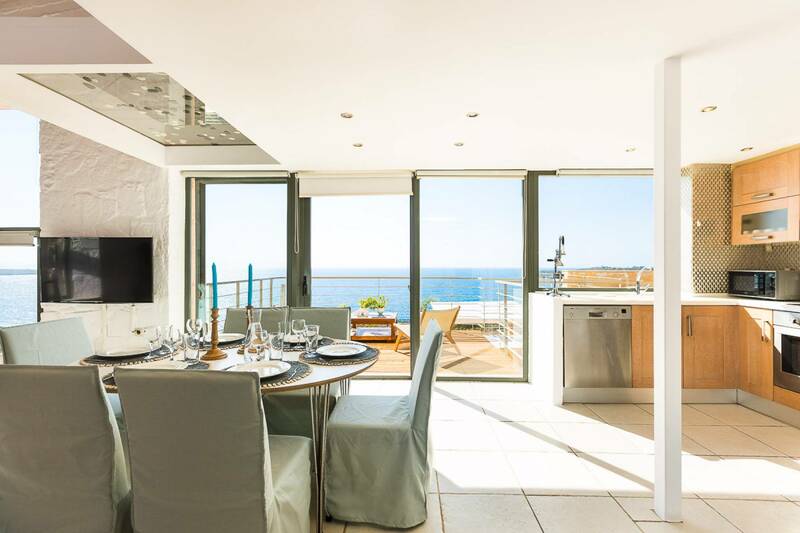 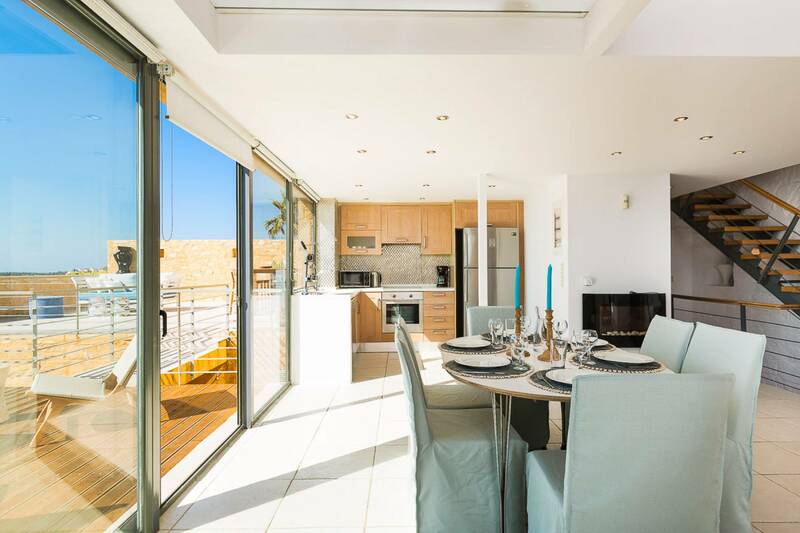 On the middle-ground floor there is a stylishly decorated living room with an open plan, fully equipped kitchen and a dining area with enough space for up to six people. 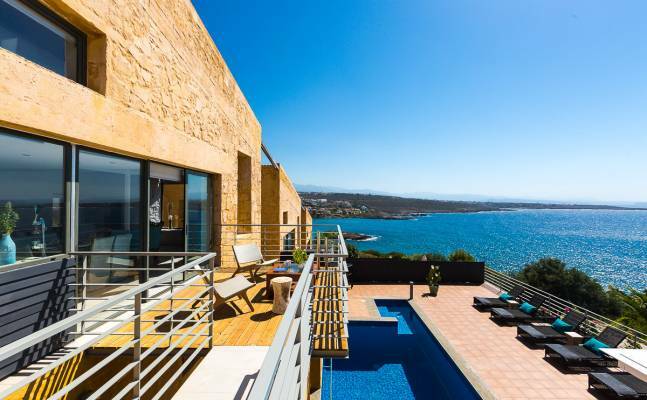 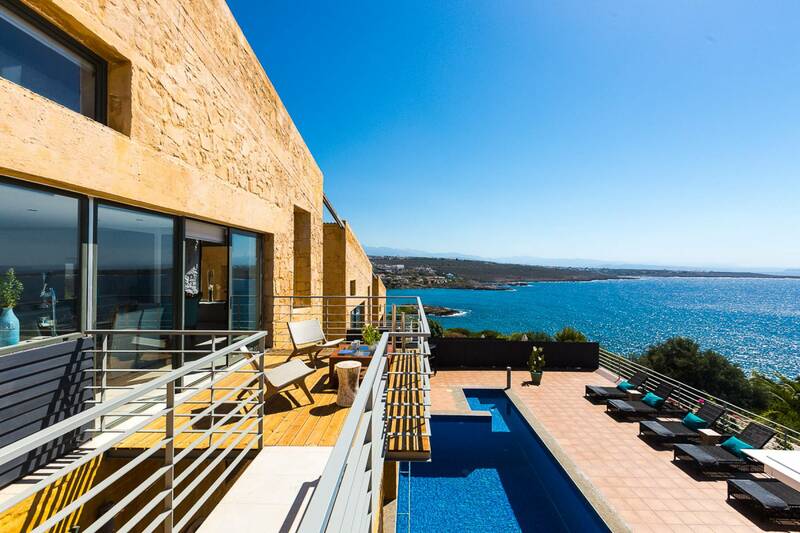 The big glass door opens up to the balcony above the pool area where you can enjoy a magnificent sea view. 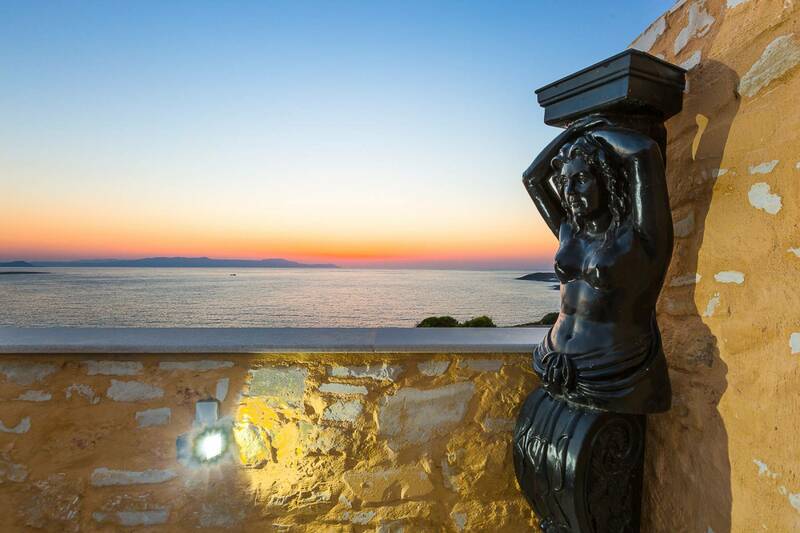 All your senses will be awakened by the sheer natural beauty of this villa. 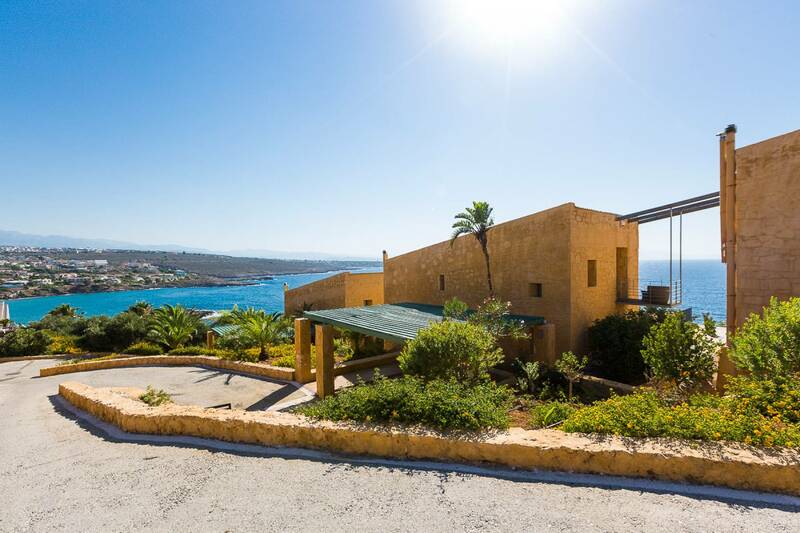 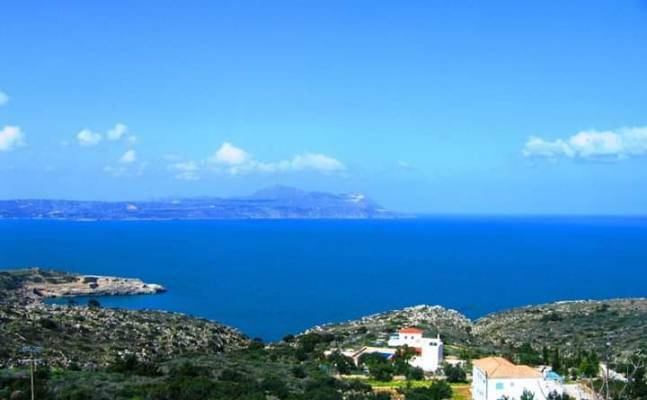 The salty aroma of the sea is mixed with the aroma of the herbs from the gardens which are laid in front of the Villa. 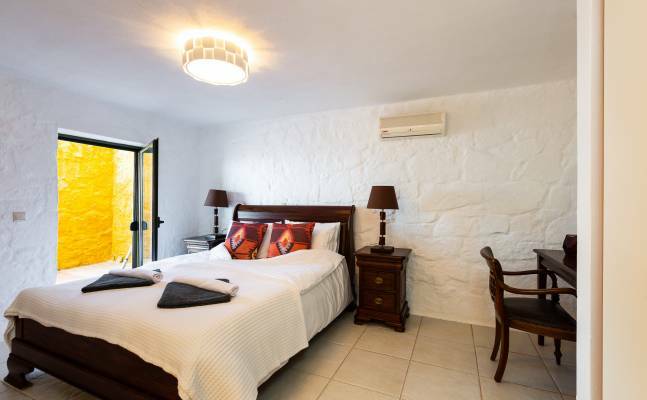 There are plenty of modern conveniences such as Wi-Fi, a flat screen smart satellite TV, a music system and A/C in the entire house (use of a/c is included in the price). 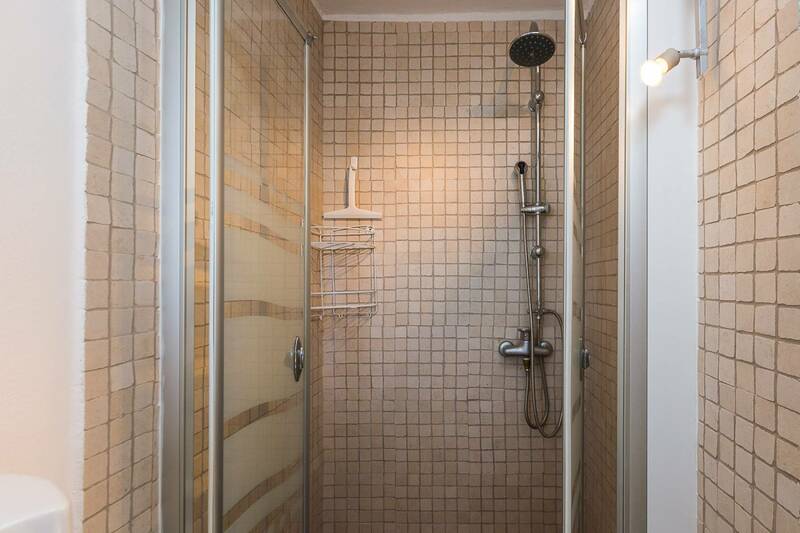 On the same floor there is also a WC. 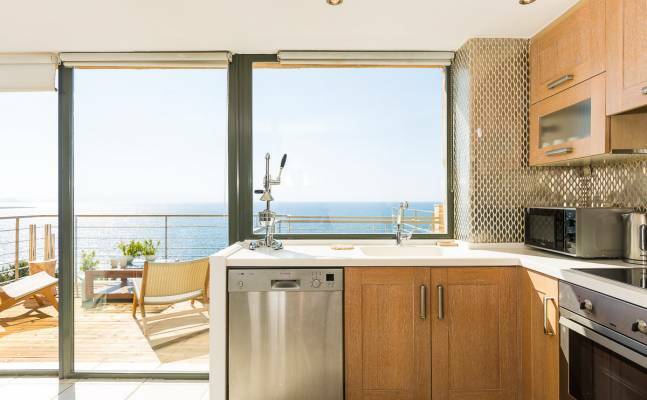 In the kitchen, there’s everything you’ll need to prepare light snacks or delicious meals by yourself or with the help of a private chef (upon request). 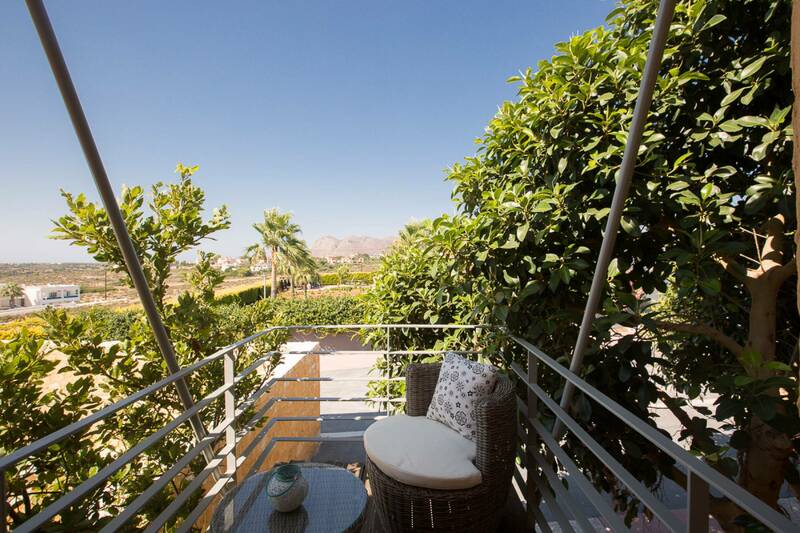 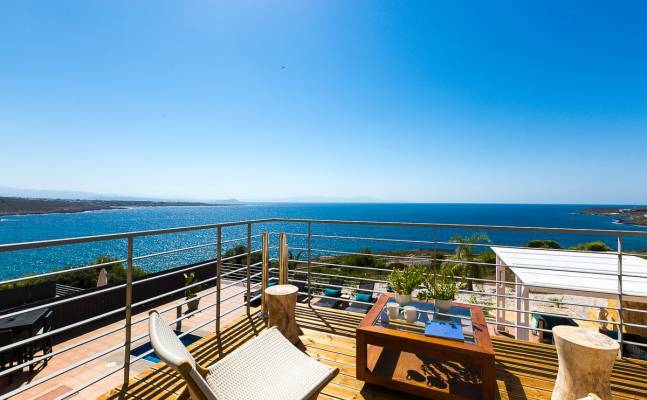 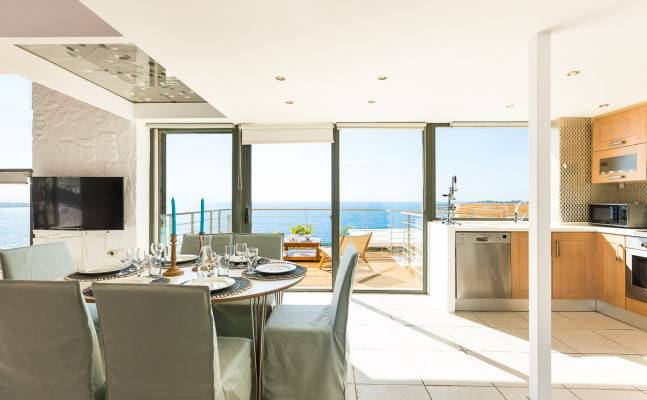 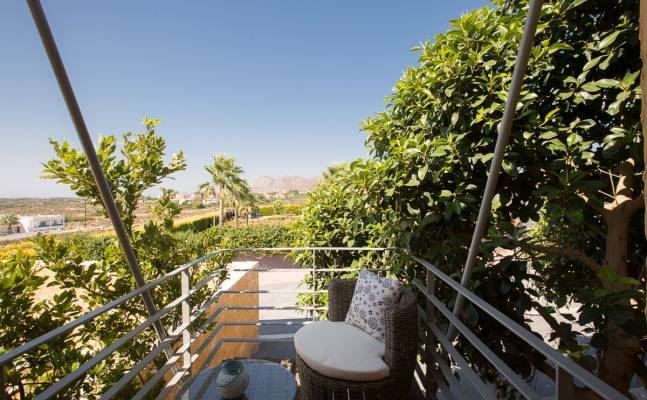 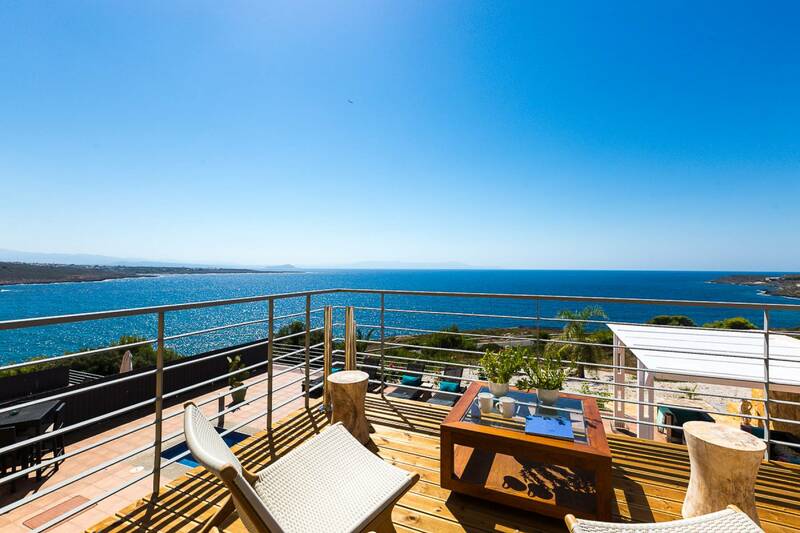 From kitchen balcony you have direct access to the big modernly furnished veranda and to the pool area. 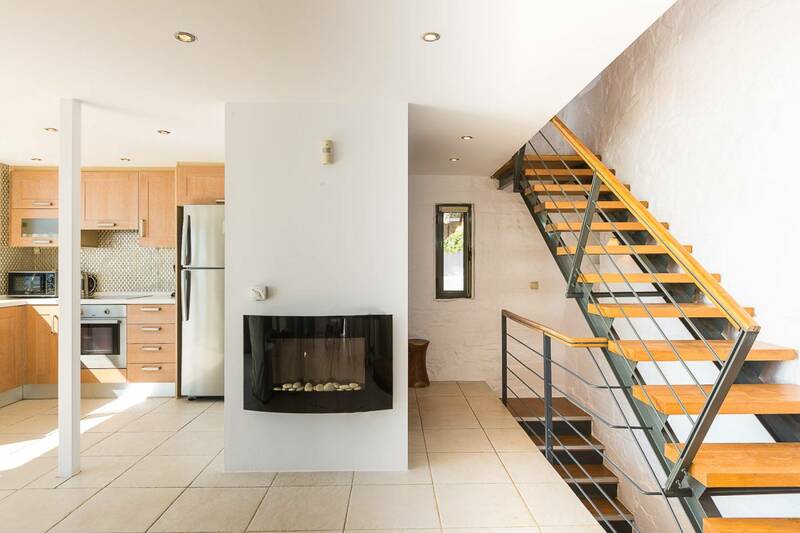 There are three bedrooms split over two levels. 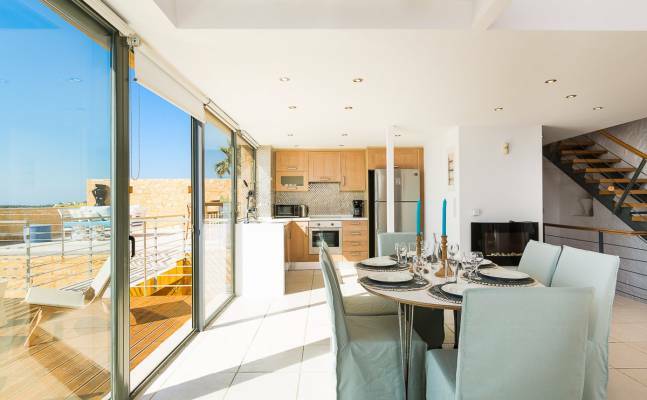 Stairs leads you to the first level, where you’ll find an open plan master bedroom, complete with a king size bed, en-suite bathroom and a separate shower cabin. 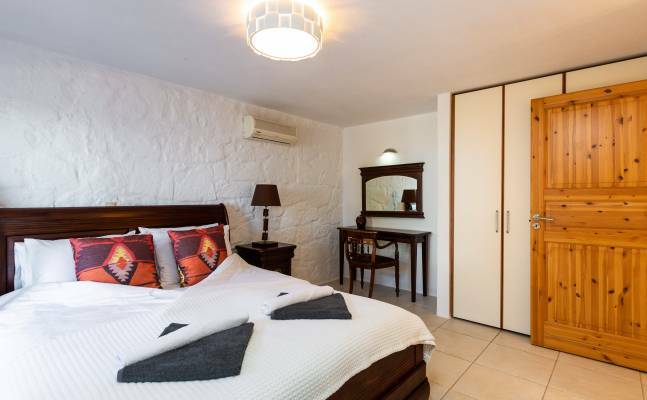 The bedroom is equipped with a flat screen TV. 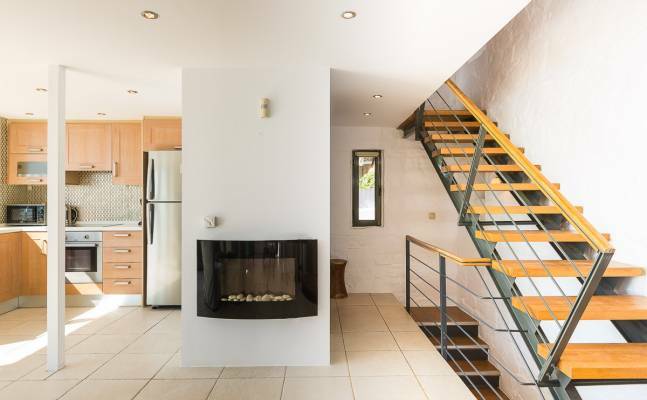 The remaining two bedrooms are located on the lower level. 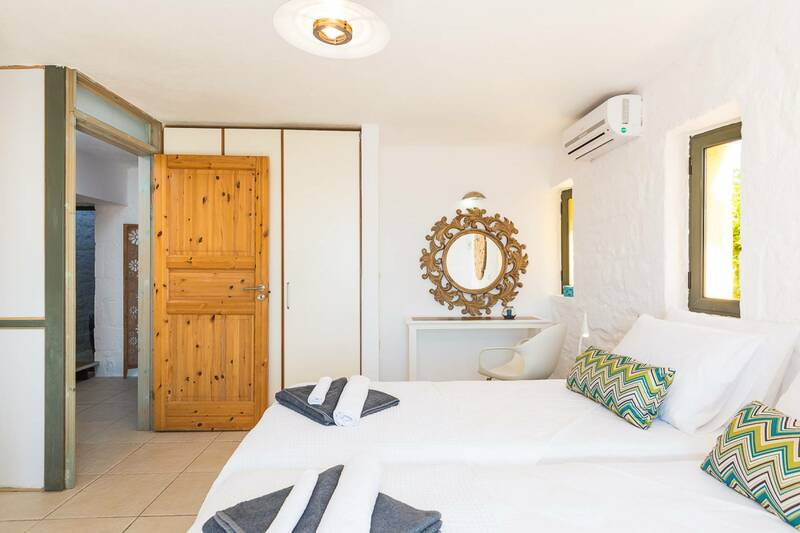 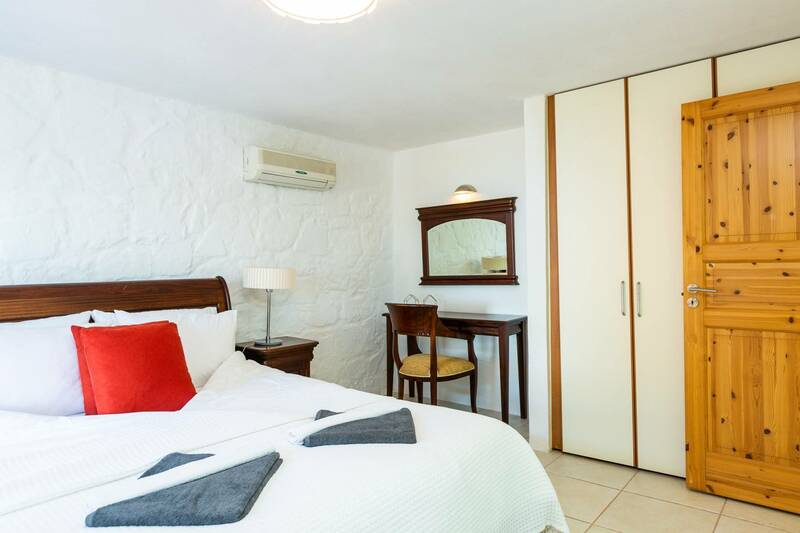 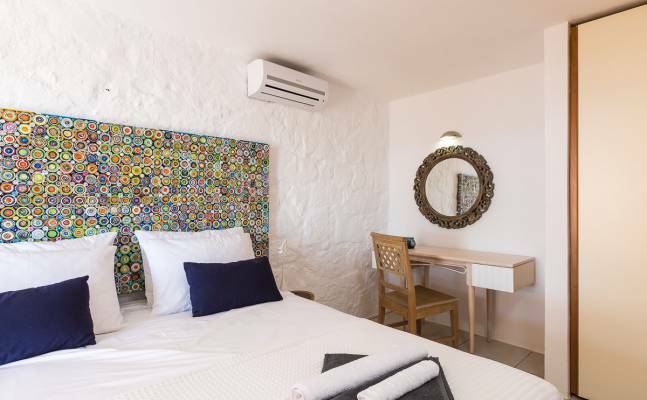 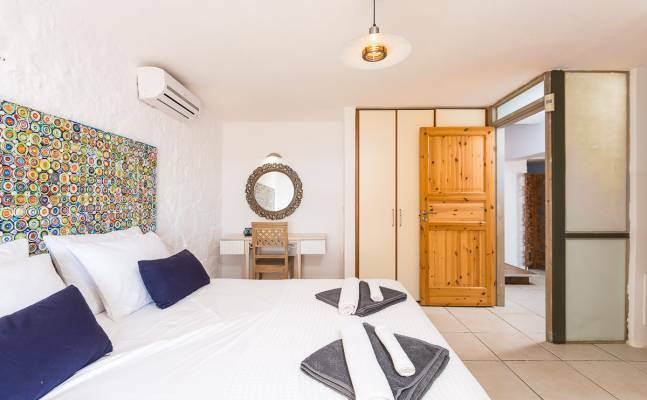 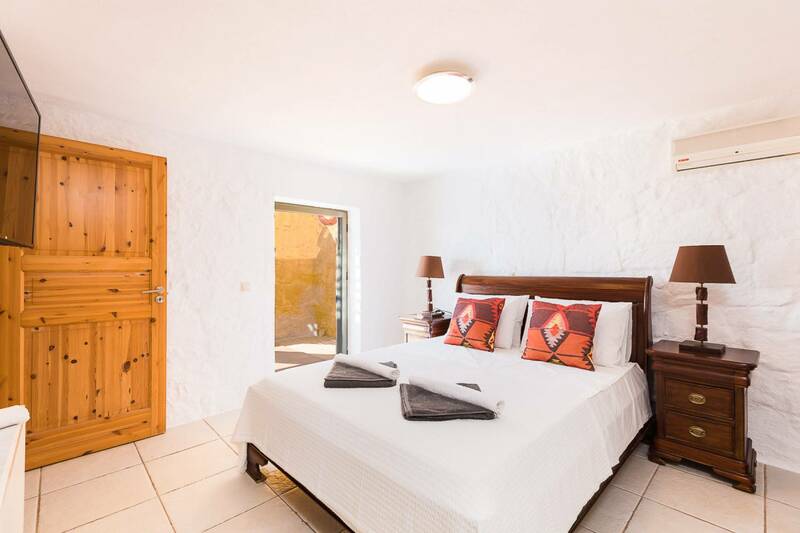 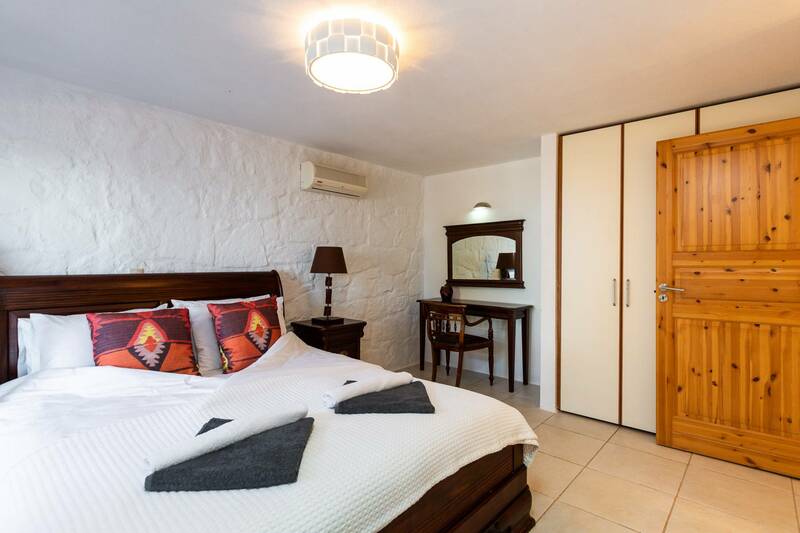 One bedroom has two single beds that can be turned into a double bed depending on your needs. 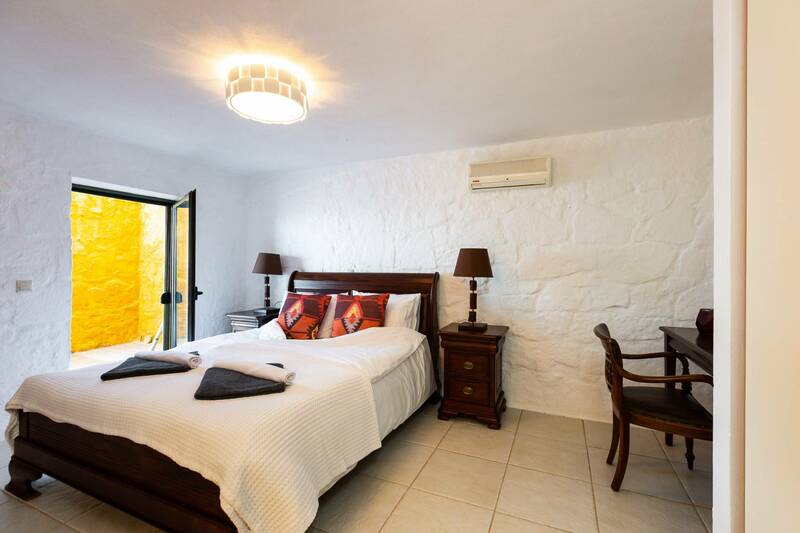 The other bedroom has a double king size bed. 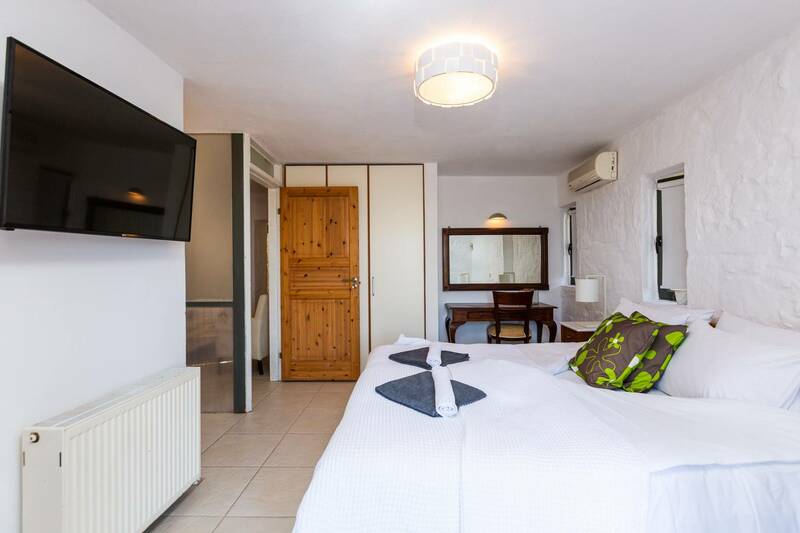 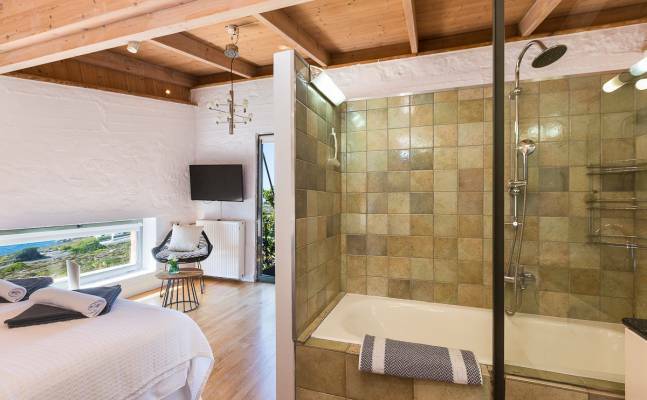 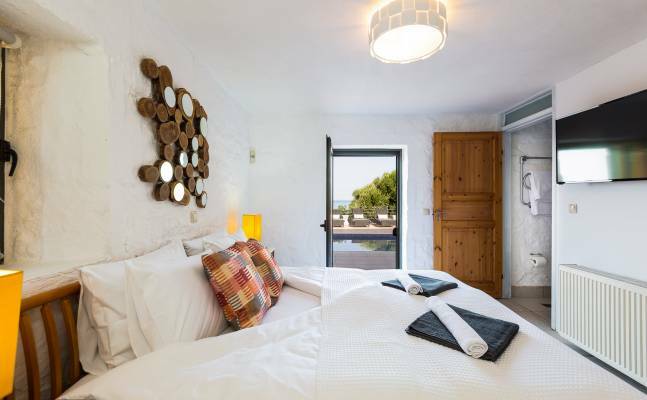 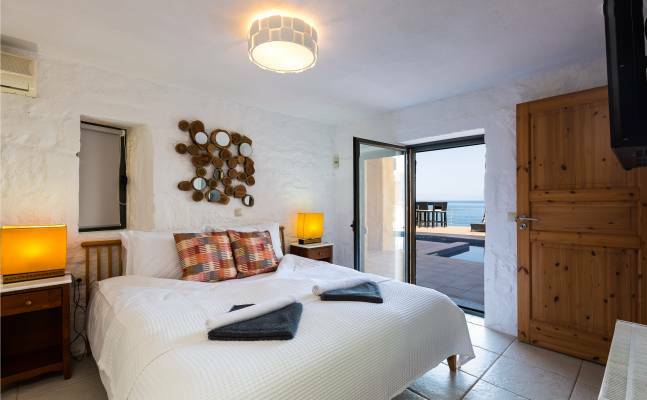 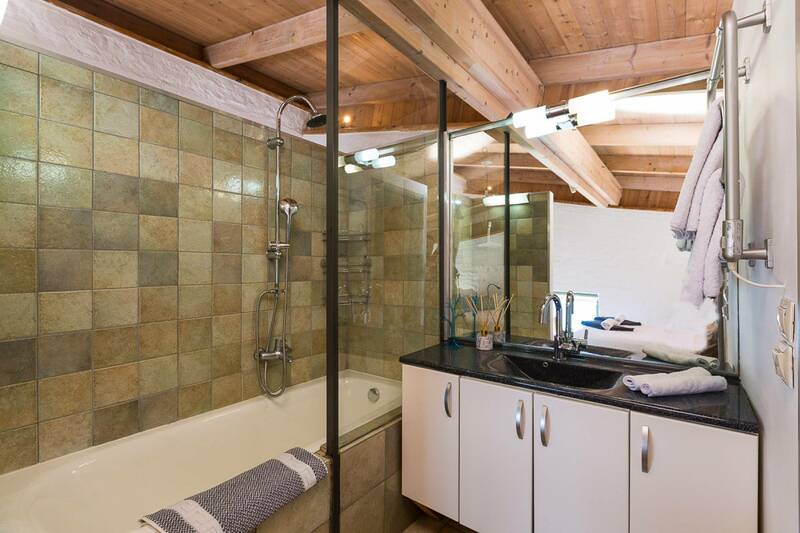 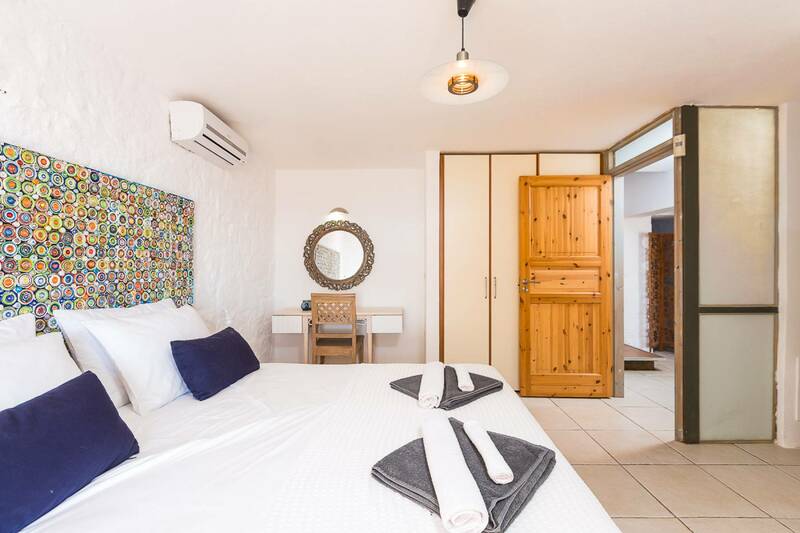 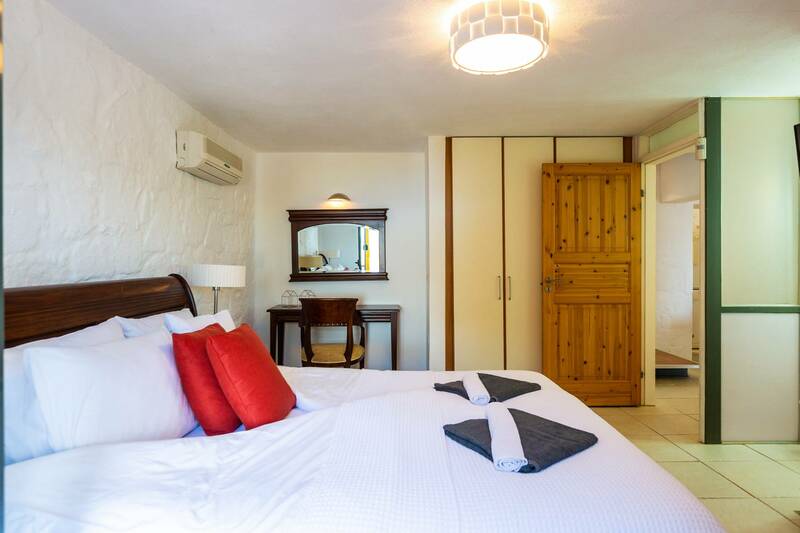 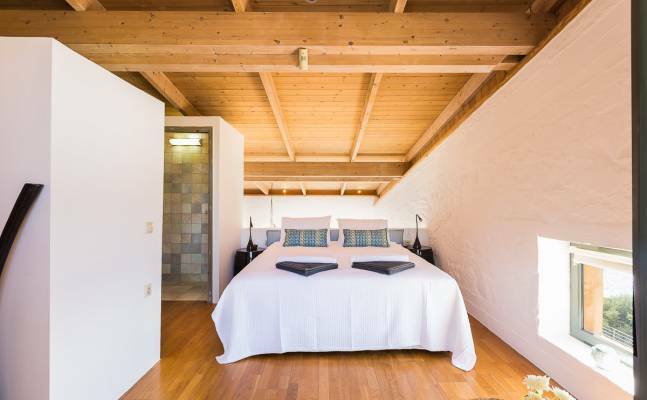 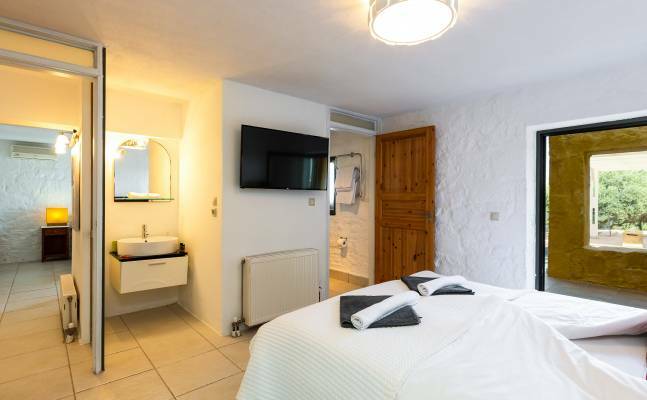 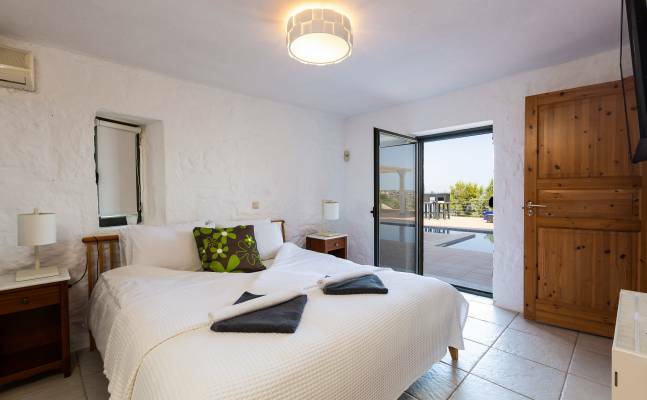 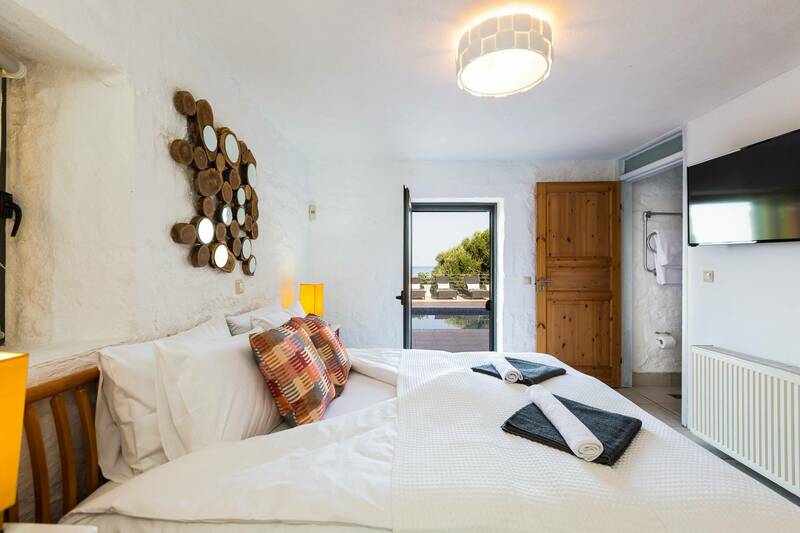 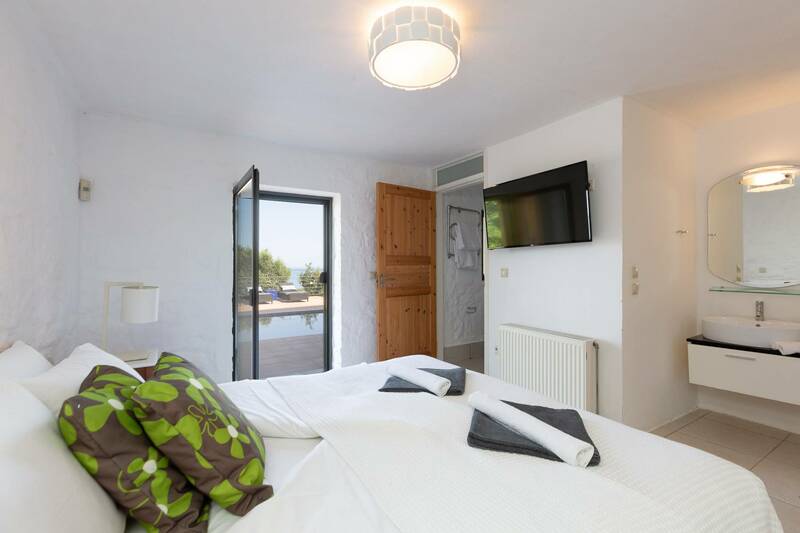 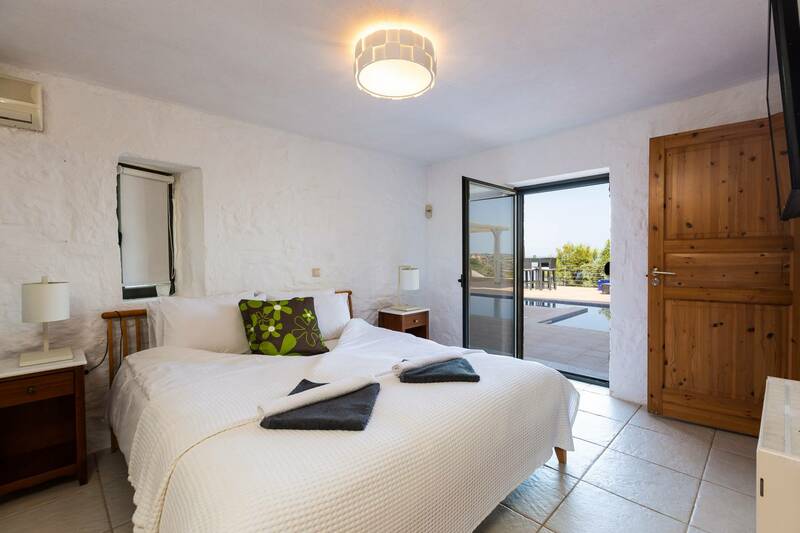 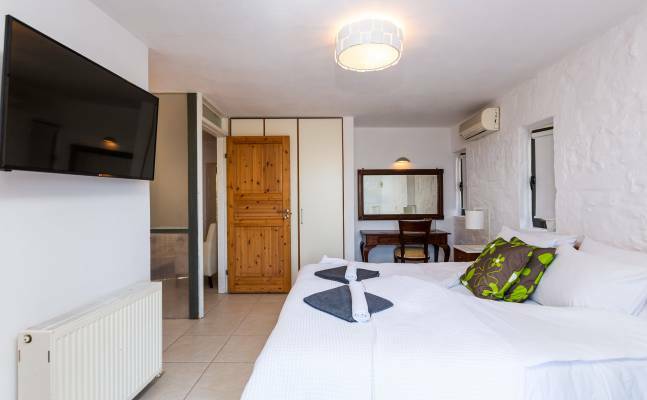 Both bedrooms on the lower floor have also en-suite bathrooms. 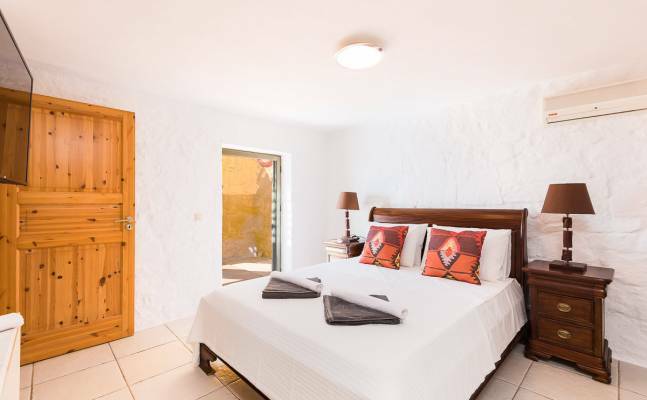 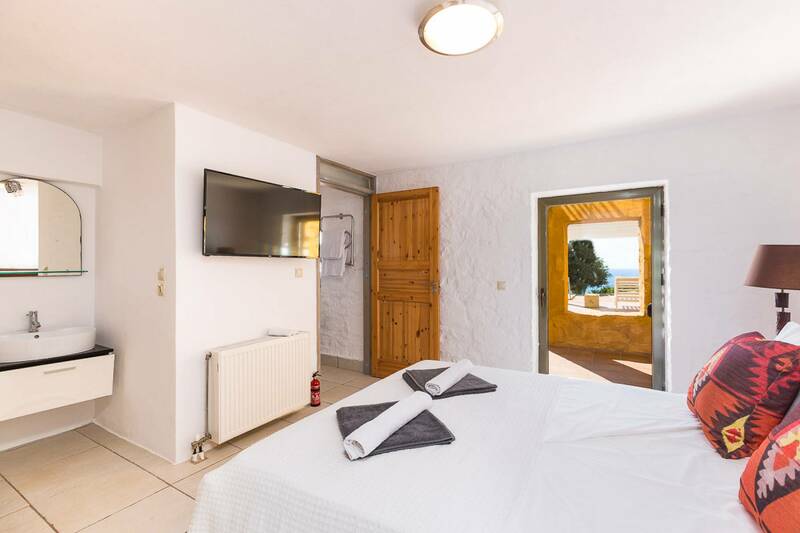 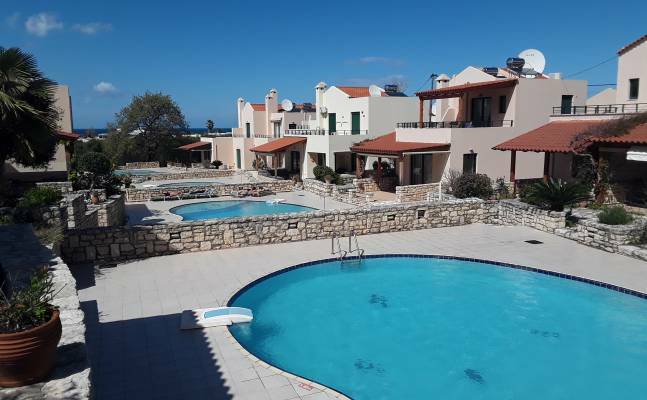 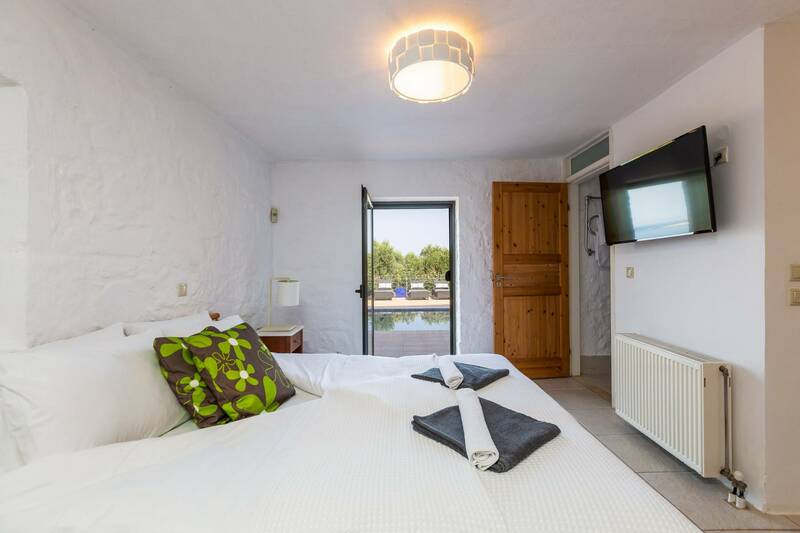 Outside of the bedrooms you will find the furnished pool area with plenty of shadow for the hot sunny days. 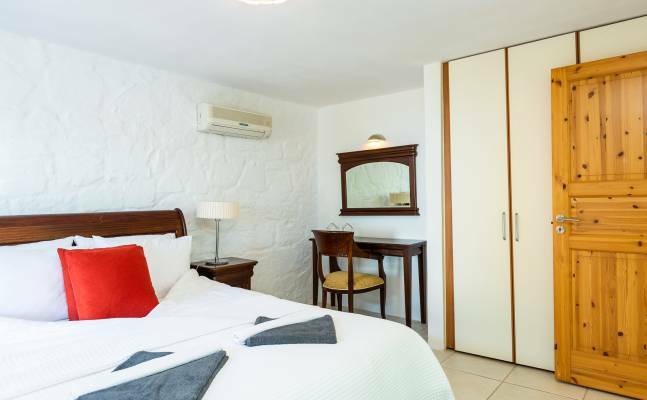 On the same level there is a laundry room with washing machine, tumble dryer and an iron with ironing board. 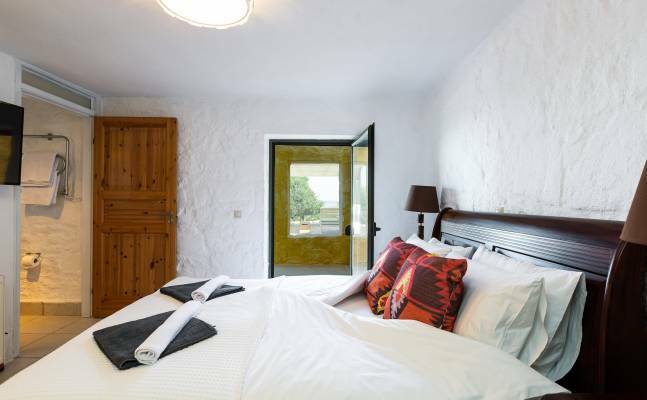 There’s also a baby cot and a baby high chair available if you need one (on request). 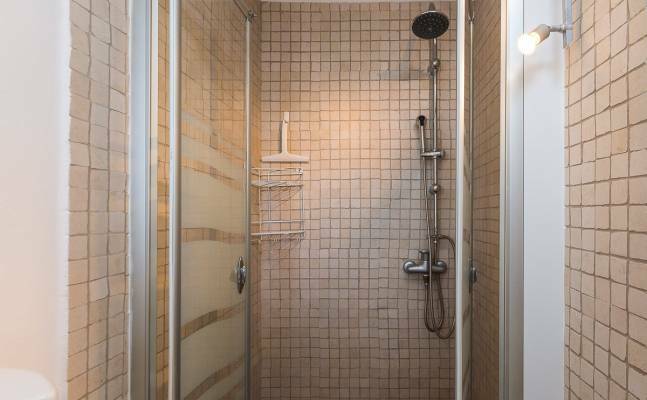 Pocket Wi-fi Internet is available. 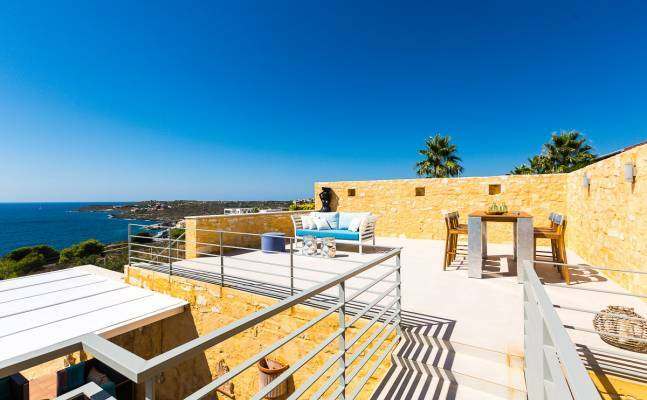 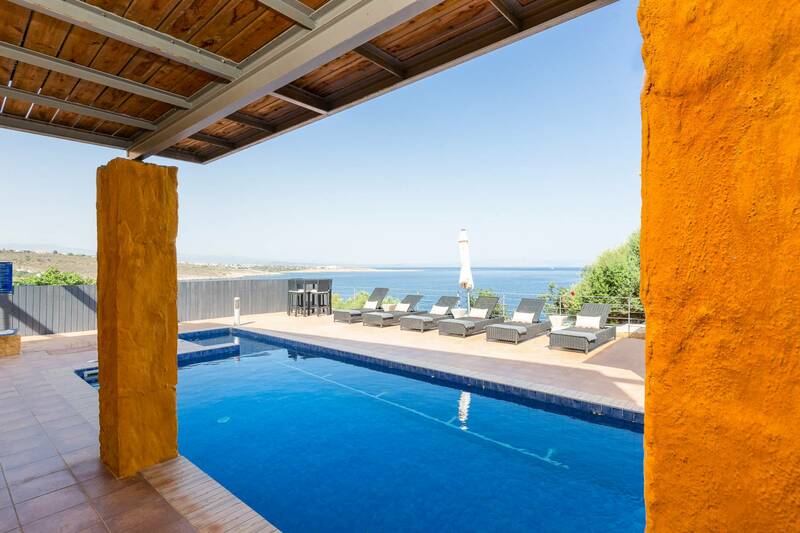 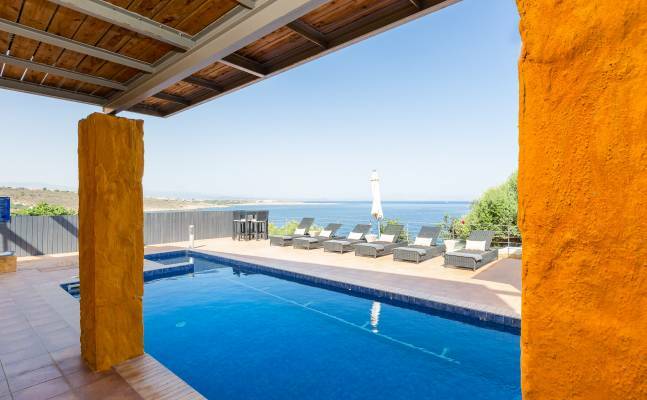 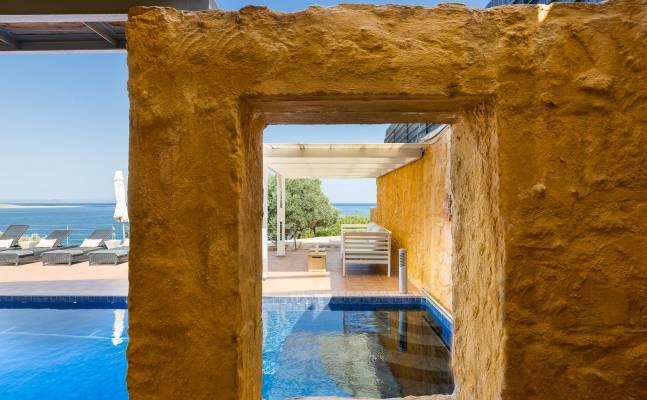 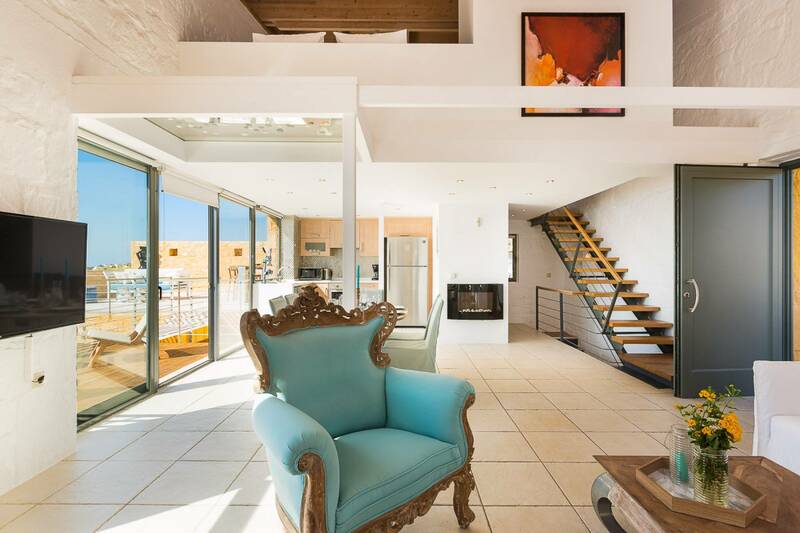 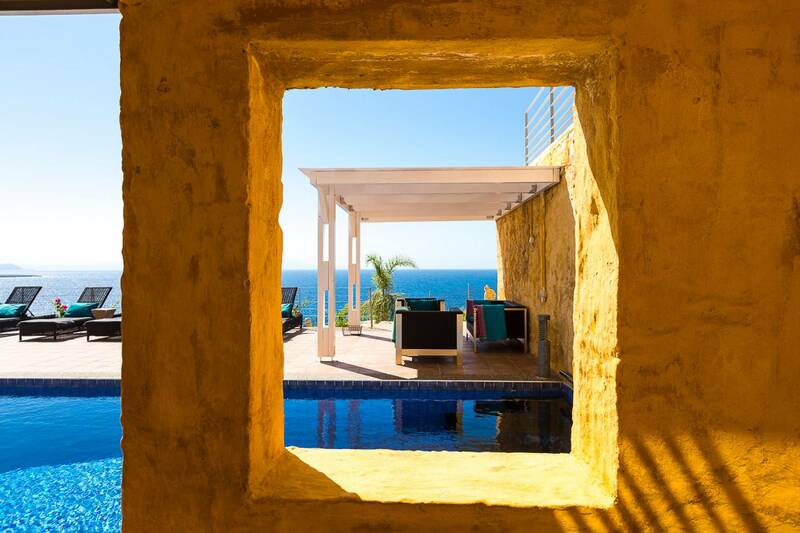 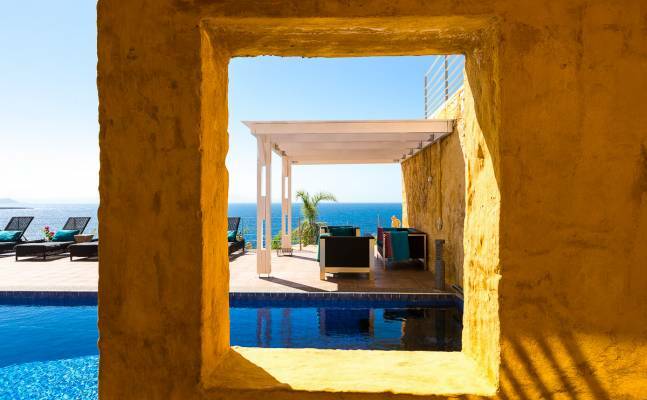 The yellow exterior walls of the property stand out brilliantly against the deep blue of the ocean, which reminds the light colours of the sunset. 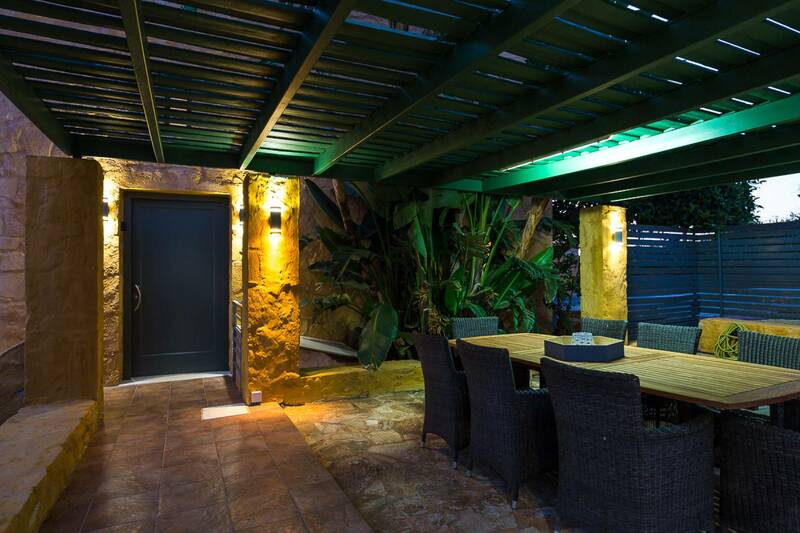 The outdoor space has many charms of its own. 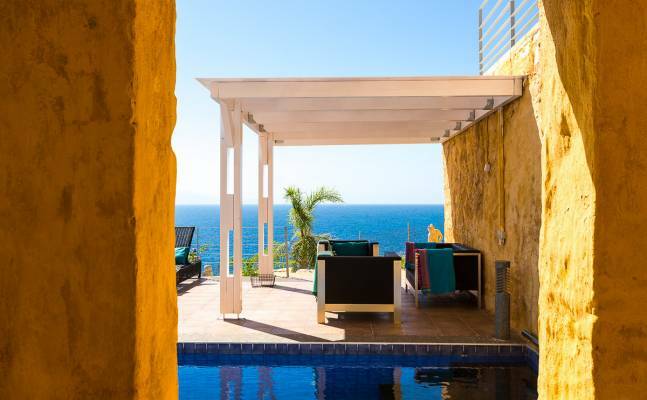 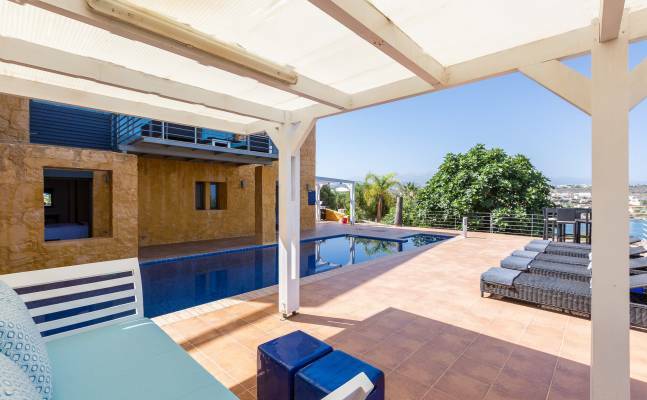 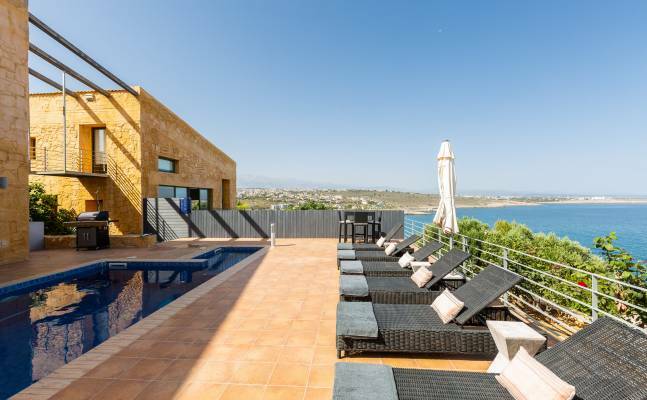 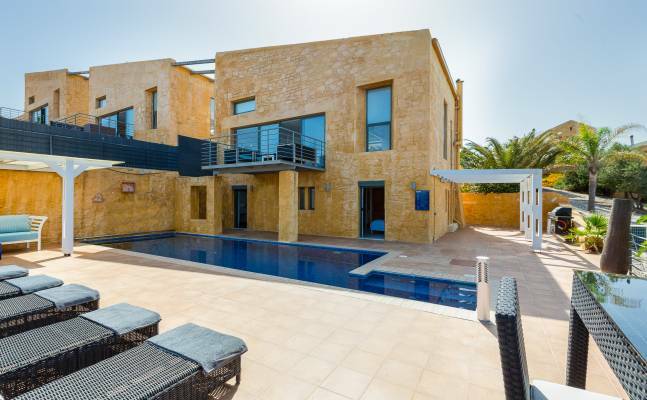 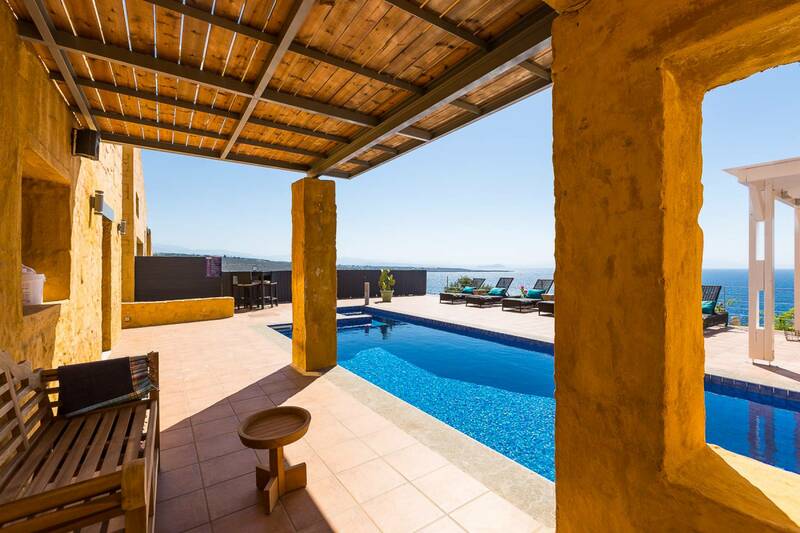 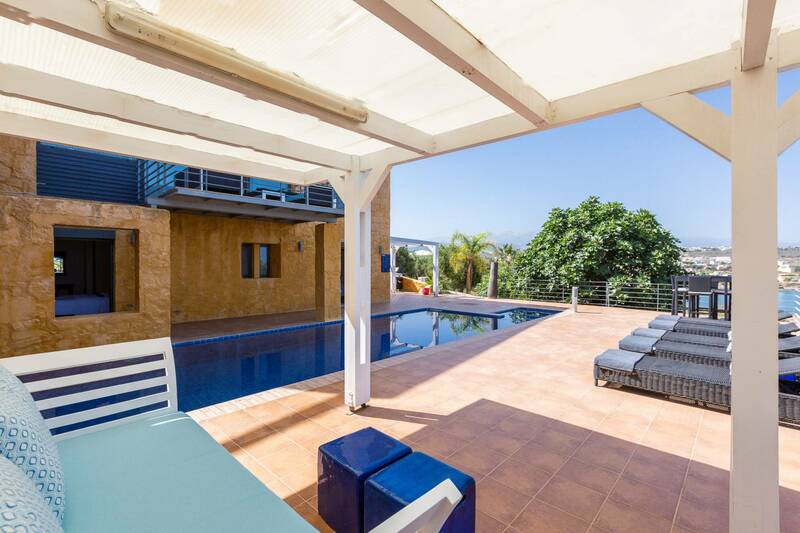 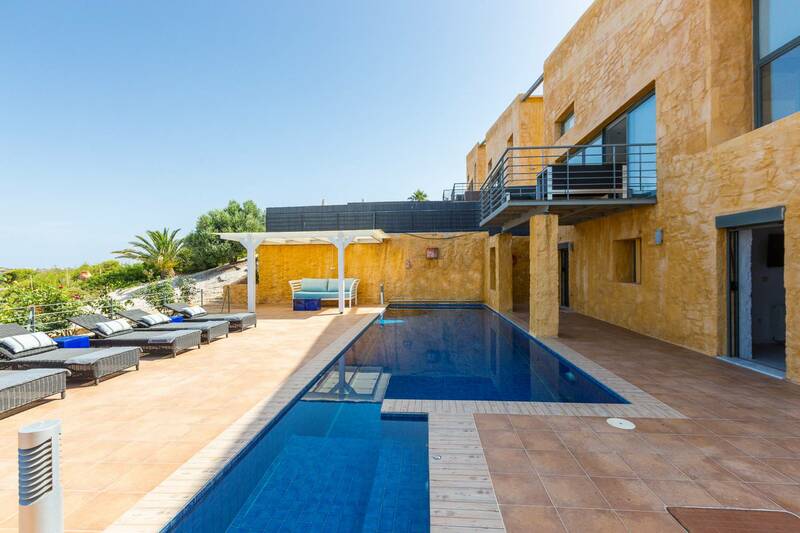 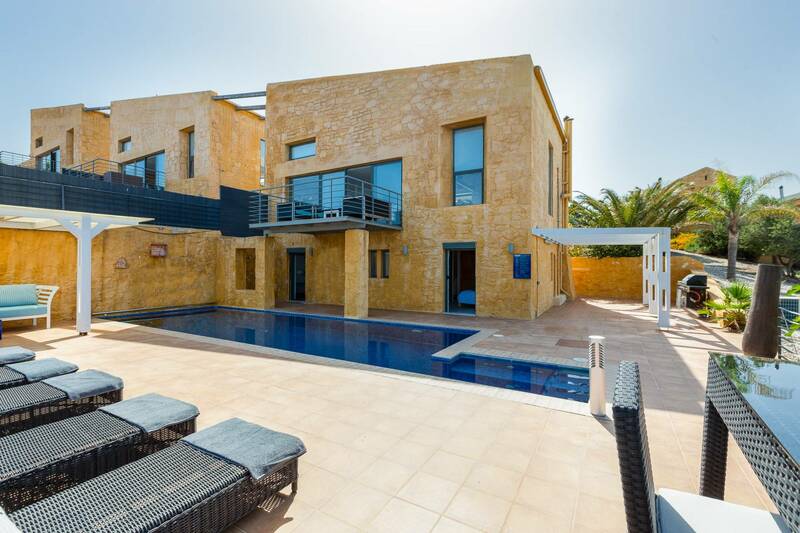 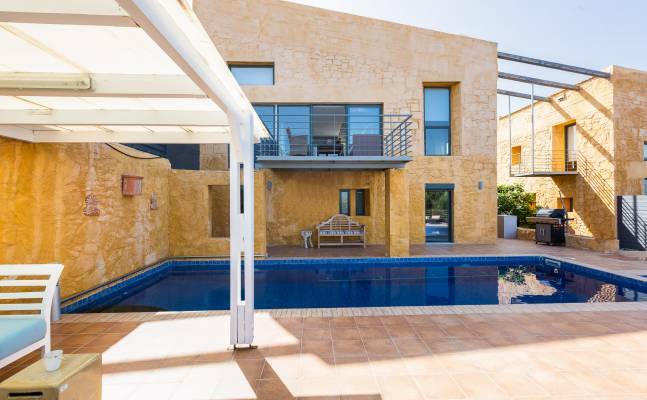 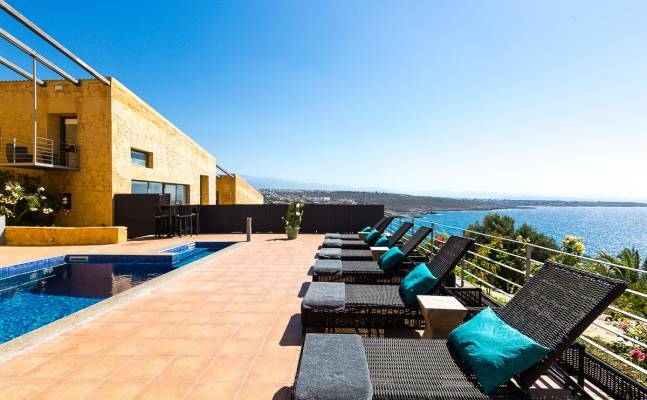 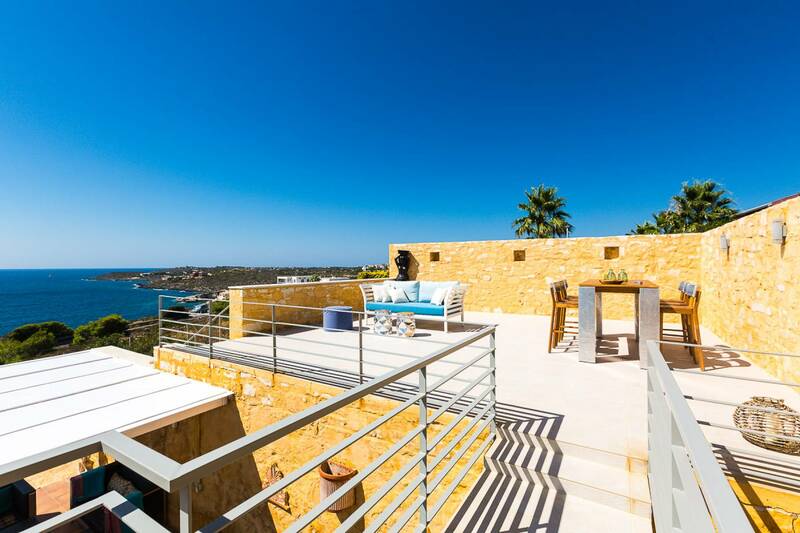 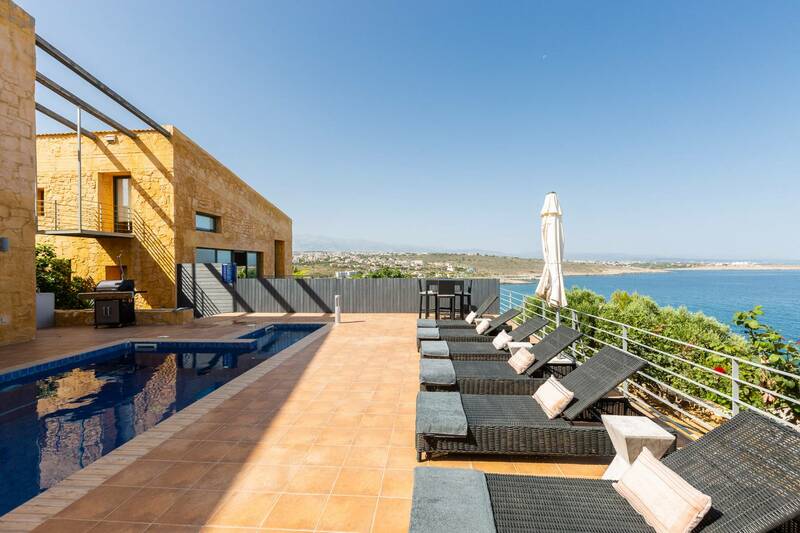 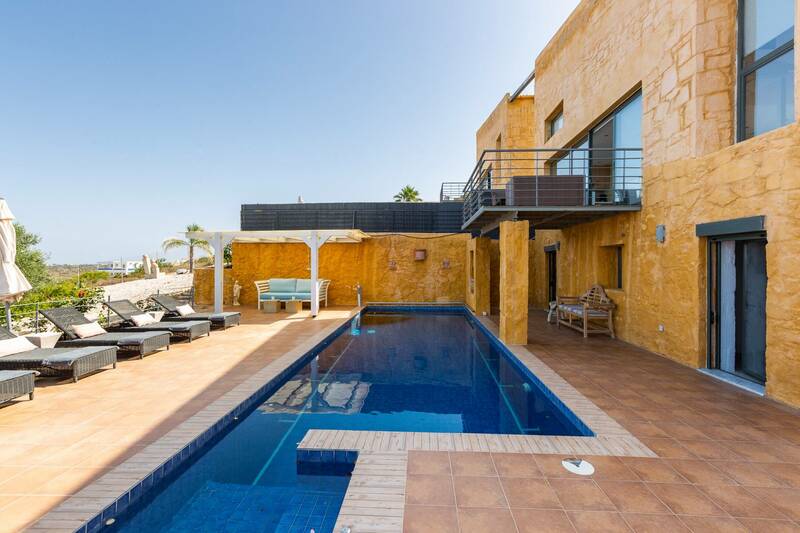 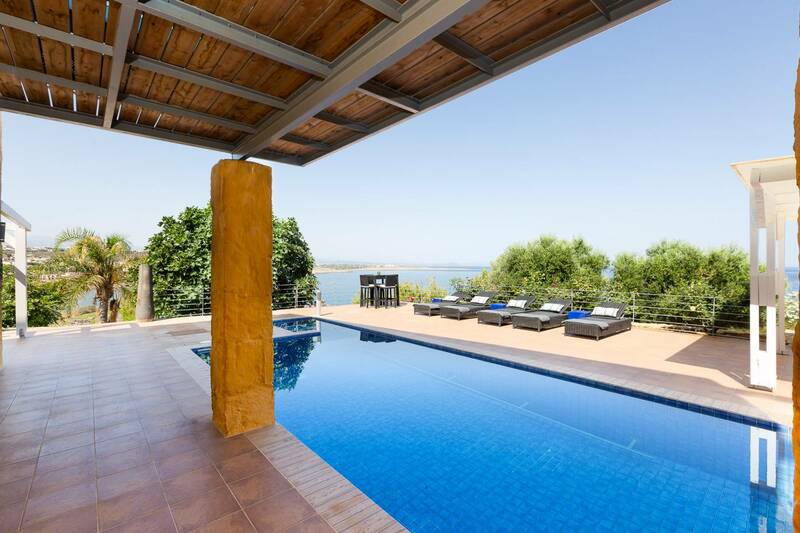 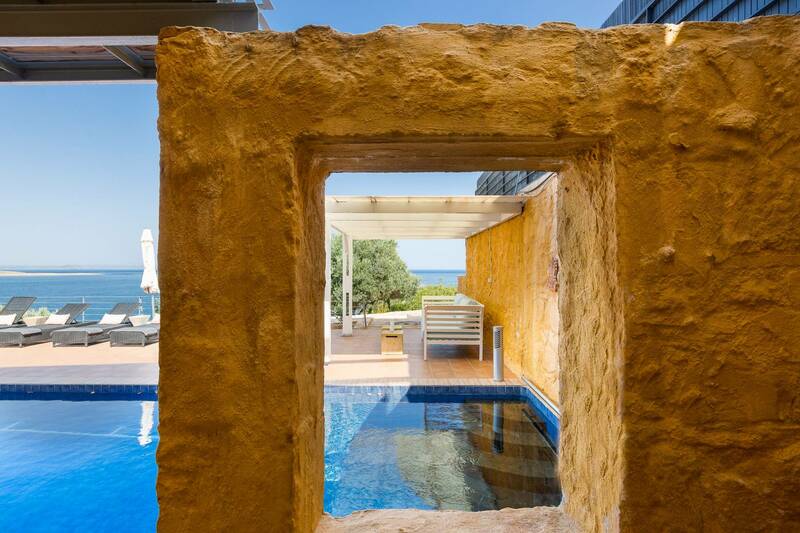 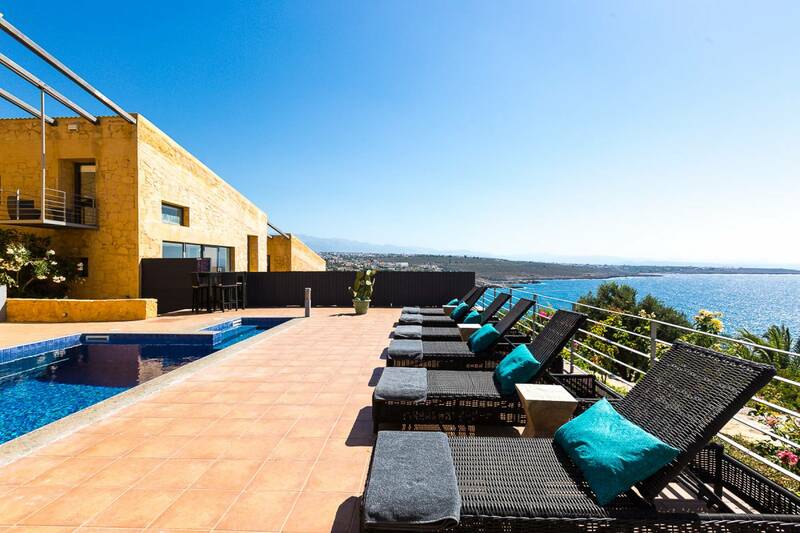 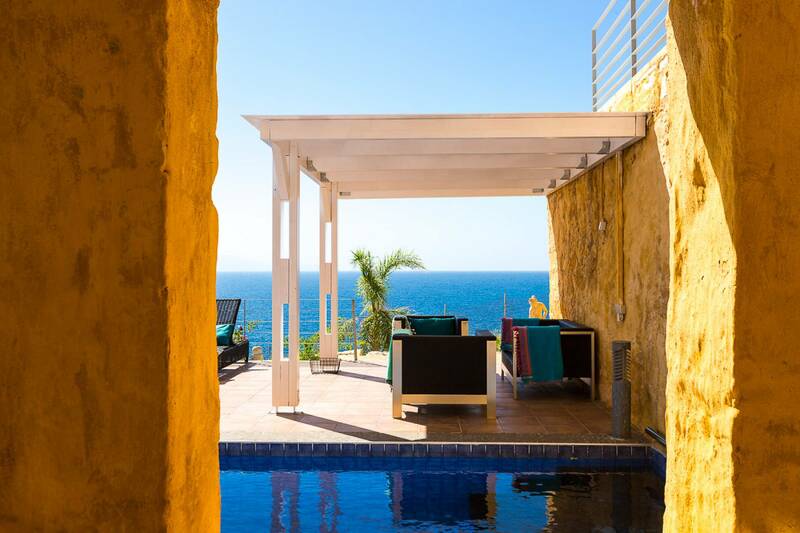 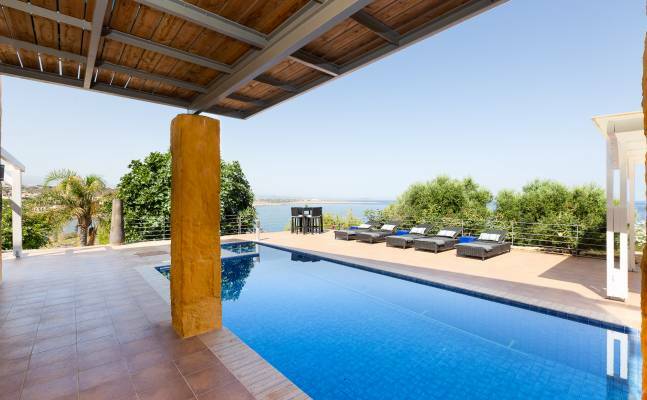 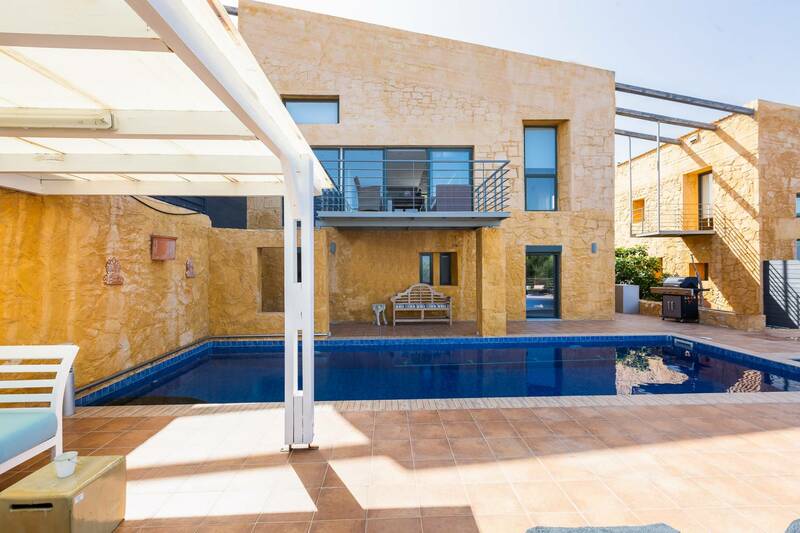 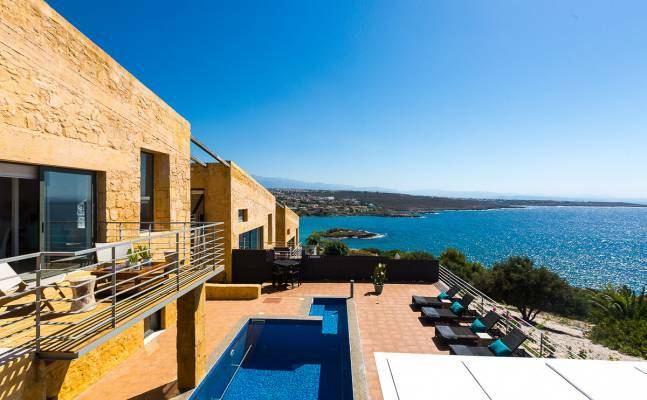 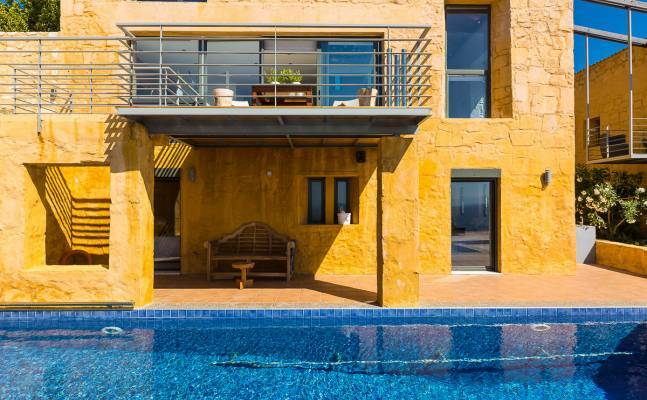 Yellow dream villa features a private swimming pool with an outdoor shower and comfortable sun beds. 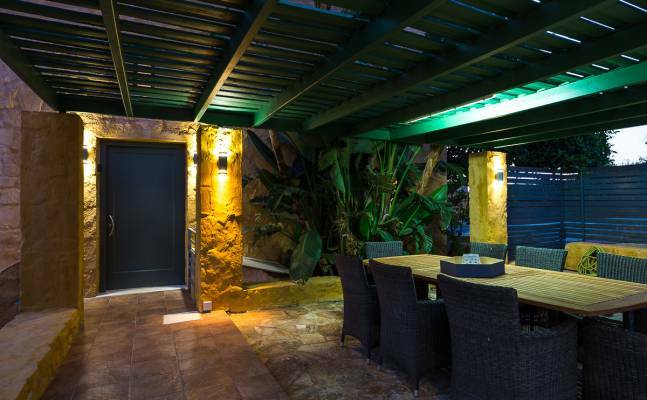 A spacious pergola cover the outdoor living area is perfect for enjoying a drink at sunset with family and friends. 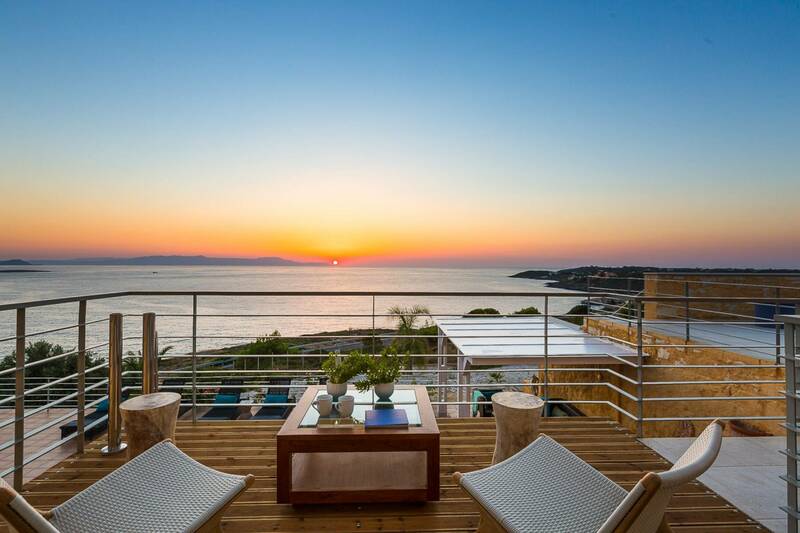 You can enjoy a magnificent scenario when the sun sets behind the mountain tops. 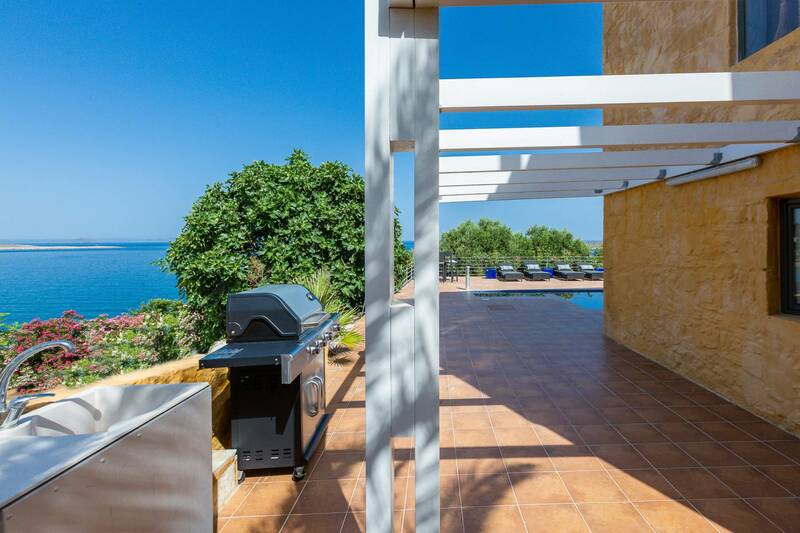 You can take a walk in the gardens and cut herbs that you can use at the BBQ for making fresh meals. 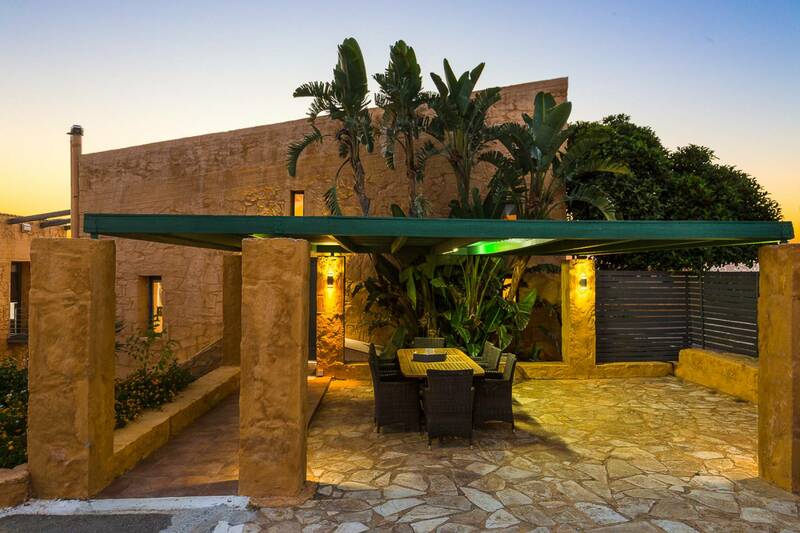 Near the entrance of the Villa, there is also a covered dining area. 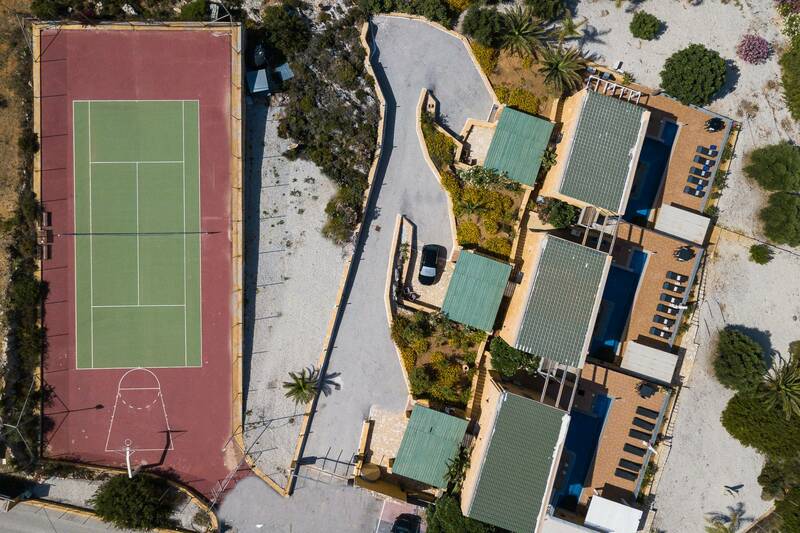 The three villas share a professional tennis court/basketball court where you can enjoy your afternoon exercise with family and friends. 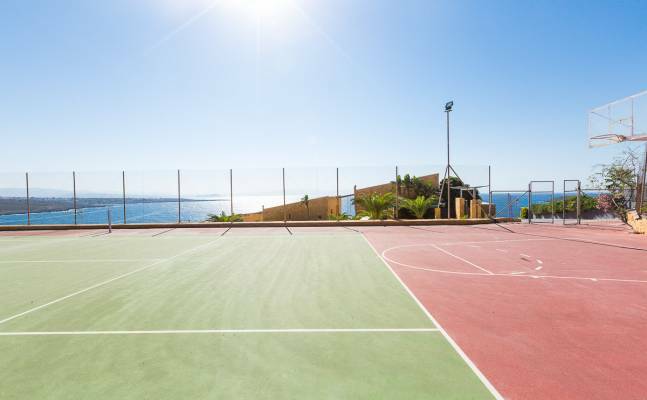 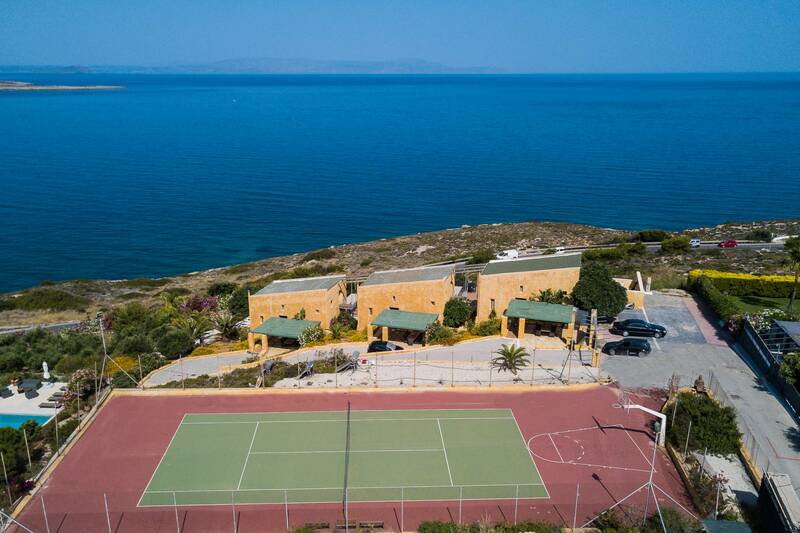 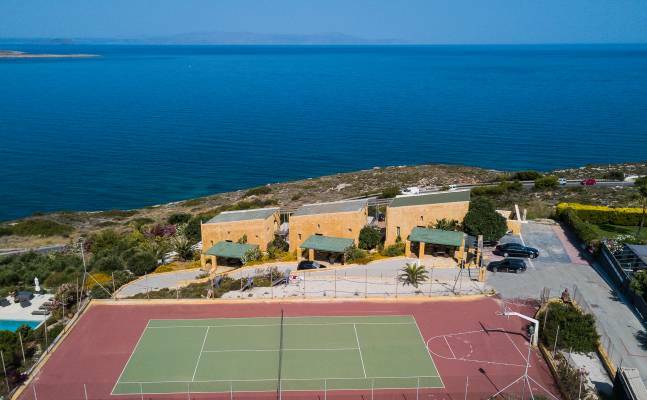 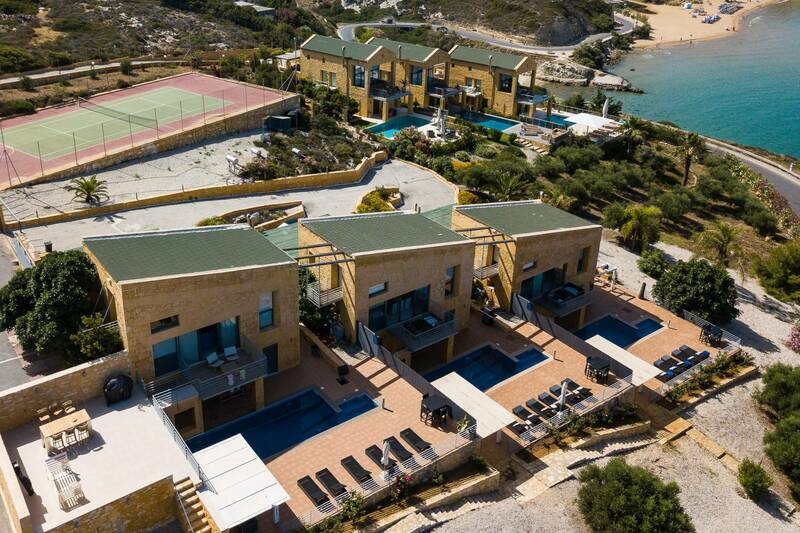 All the necessary equipment as tennis rackets, tennis balls and basket balls are available in the Villas. 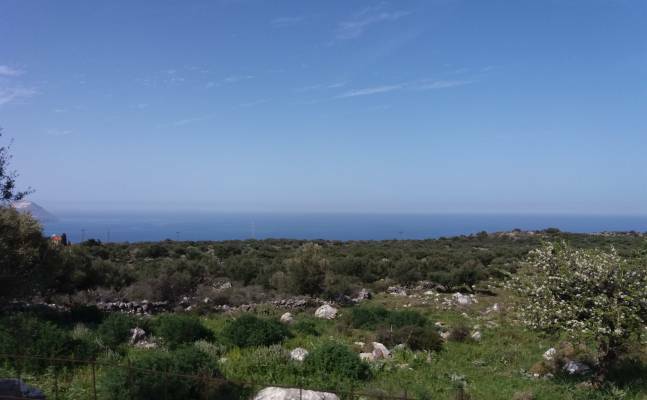 For more privacy and children’s safety, the whole area is surrounded by a stone wall from the road side and fenced off discretely from the field side.